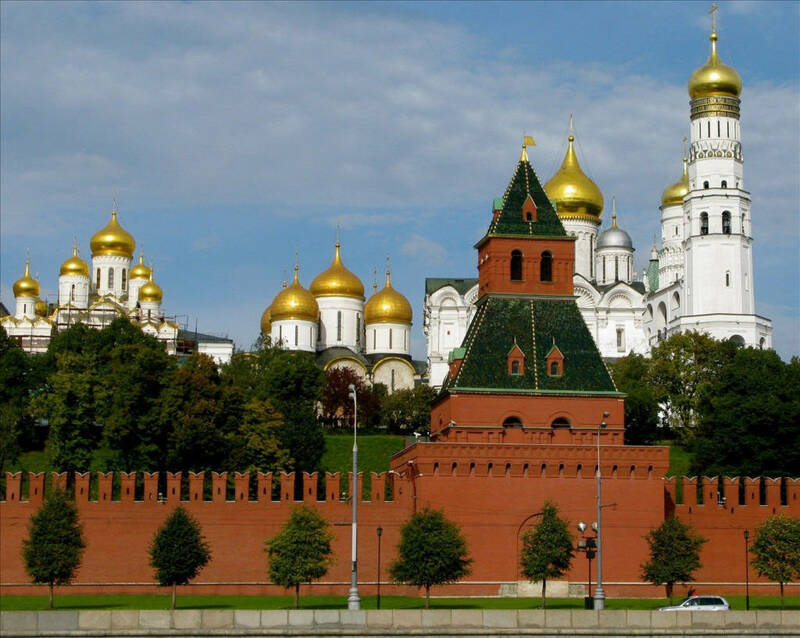 The Kremlin is one of Russia’s major monuments and Europe’s largest active fortress. 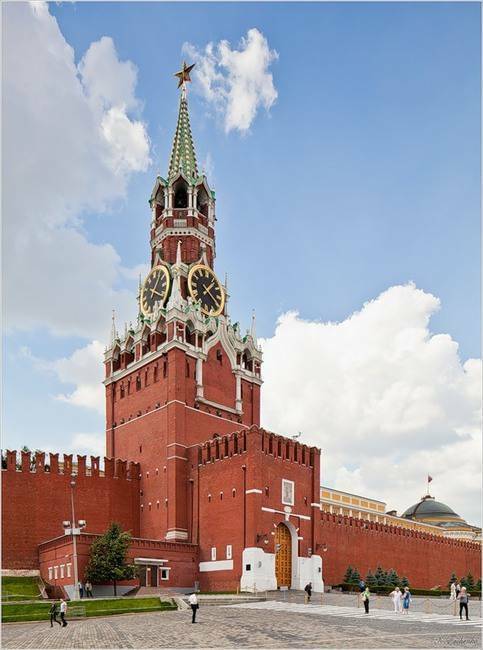 The Kremlin’s beauty resides in its stylish towers and architectural designs. 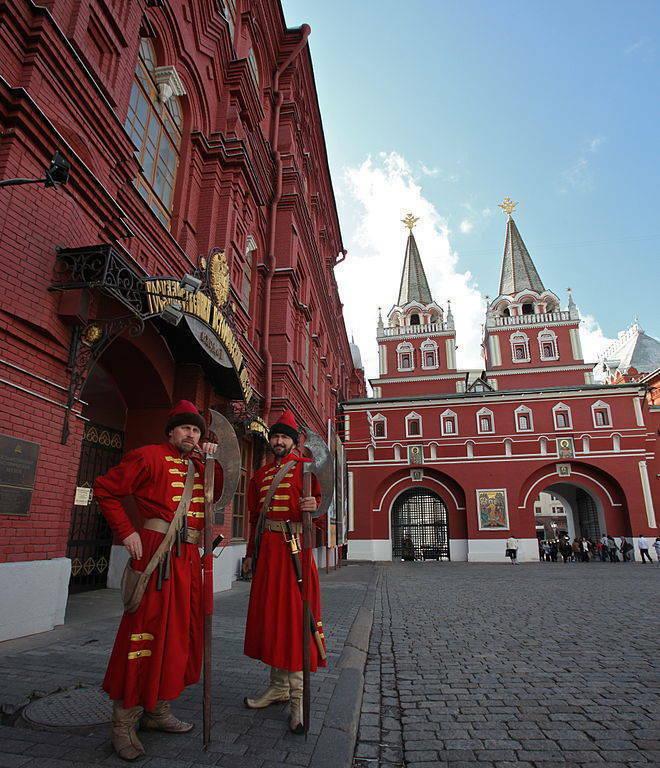 Hidden behind the Kremlin’s walls, and open to the public, stand grand cathedrals and palaces from different periods, museums, the Armoury and the Russian Diamond Fund. 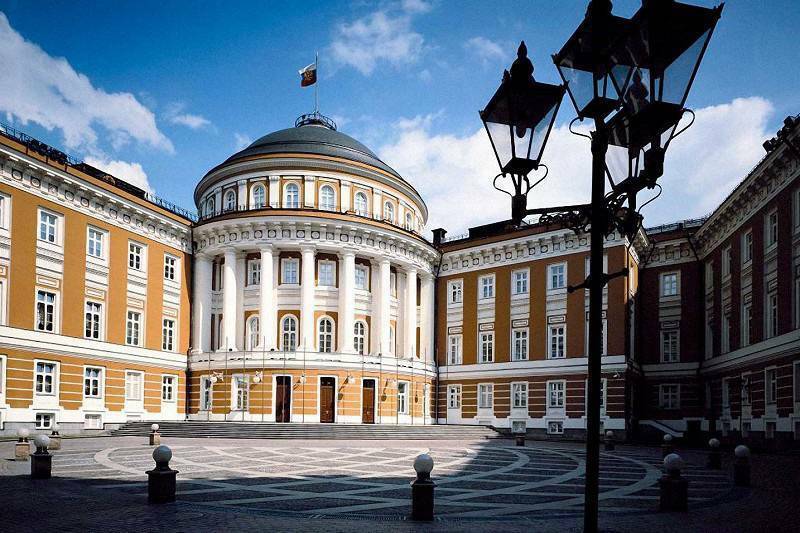 Today, the Kremlin is Moscow’s main historical and artistic landmark, and the official residence of the President of the Russian Federation. 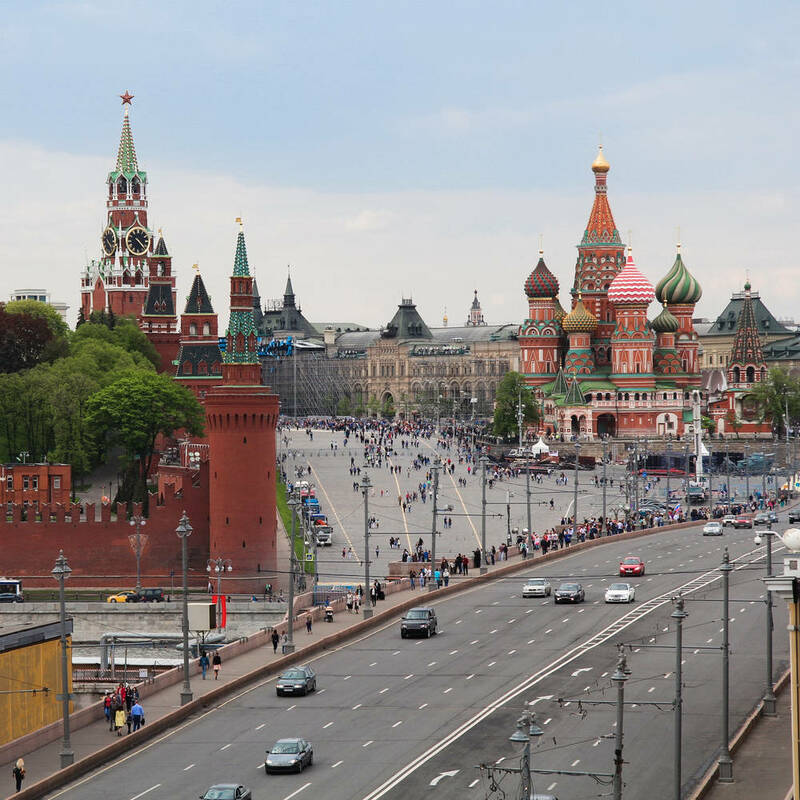 Unofficially regarded as Russia’s main square, the world-famous Red Square adjoins the Kremlin’s northeastern wall and its monuments reflect Moscow’s centuries-old history. 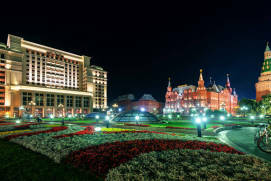 The same space encompasses churches, ramparts and towers, museums, a necropolis, a mausoleum and a huge shopping mall. 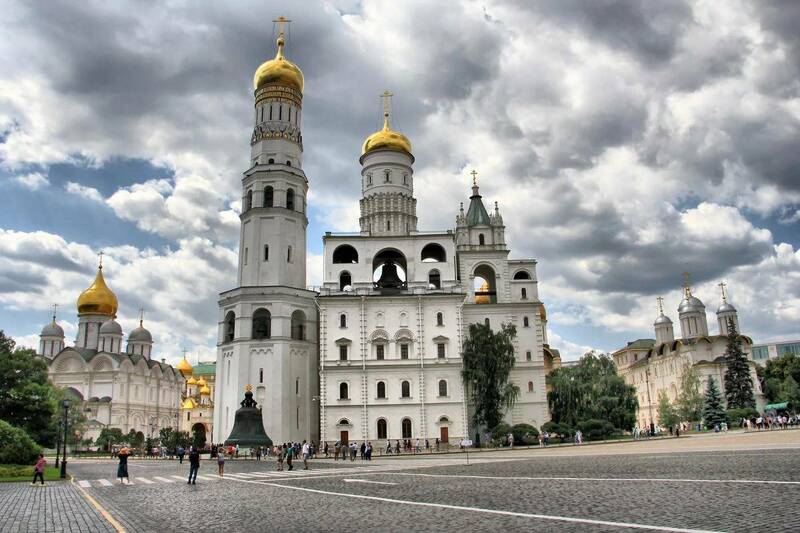 The Kremlin’s buildings, constructed between the 15th and 20th centuries, create an architectural ensemble of astonishing beautiful in its variety. 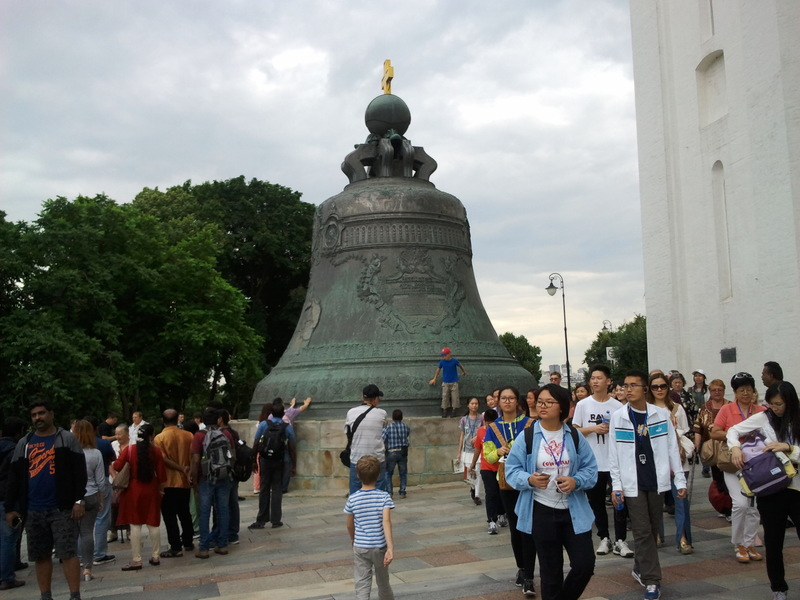 Both tourists and thousands of Muscovites come here in crowds every day. 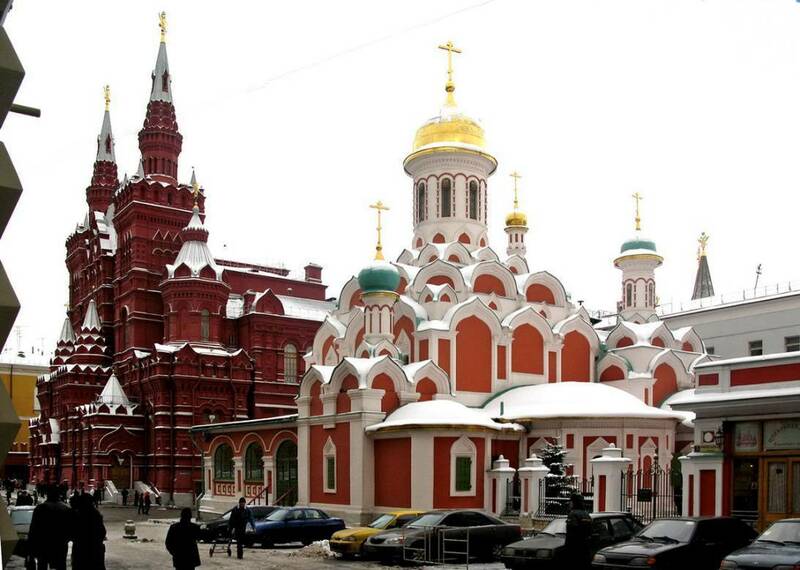 Red Square breathes in the life of a modern metropolis, yet also signifies Russia’s deep culture and history. 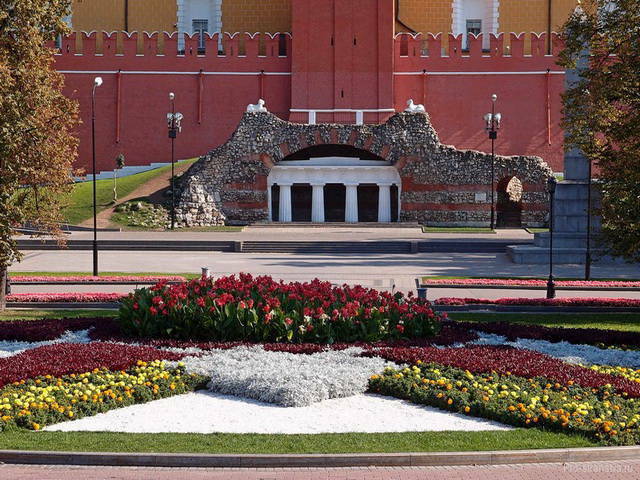 The Moscow Kremlin is perched on the high Borovitsky Hill, overlooking the Moskva River. 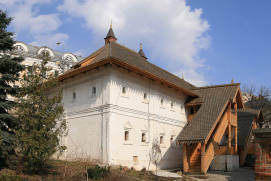 This ancient church grew to its present size in the 15th century. 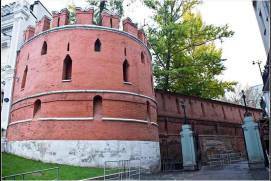 The total area of the Kremlin is over 27 hectares, and the length of the walls, with its twenty unique towers, is over 2 kilometers! 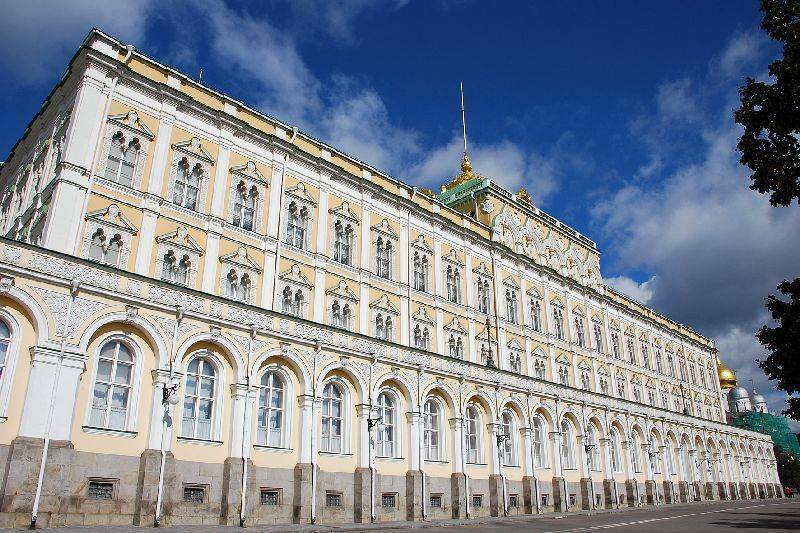 Inside the Kremlin are the grand Sobornaya (Cathedral) Square (15th-16th c.), several fascinating museums, and the residence of the Russian President. Red Square is in the heart of Russia’s capital and a point of contact between Moscow’s past and present. 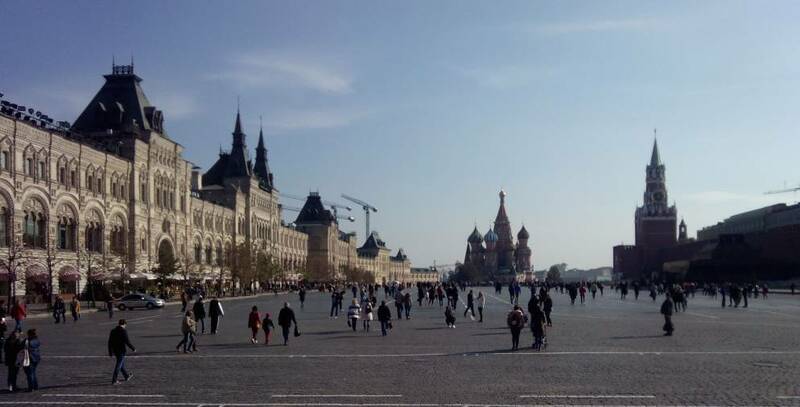 A walk along the stone paving of Red Square has become a mandatory activity for any visitor coming to Moscow. 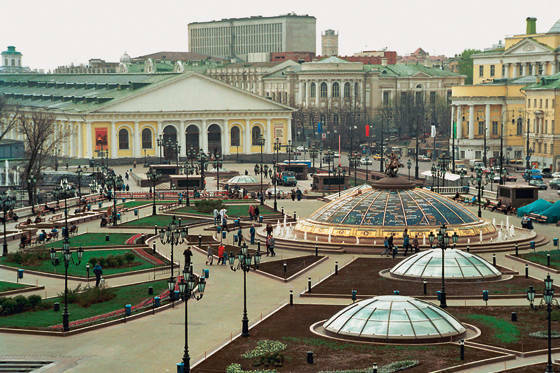 Celebrations, concerts, public festivities, Victory Day and the November 7 military parades all take place here. 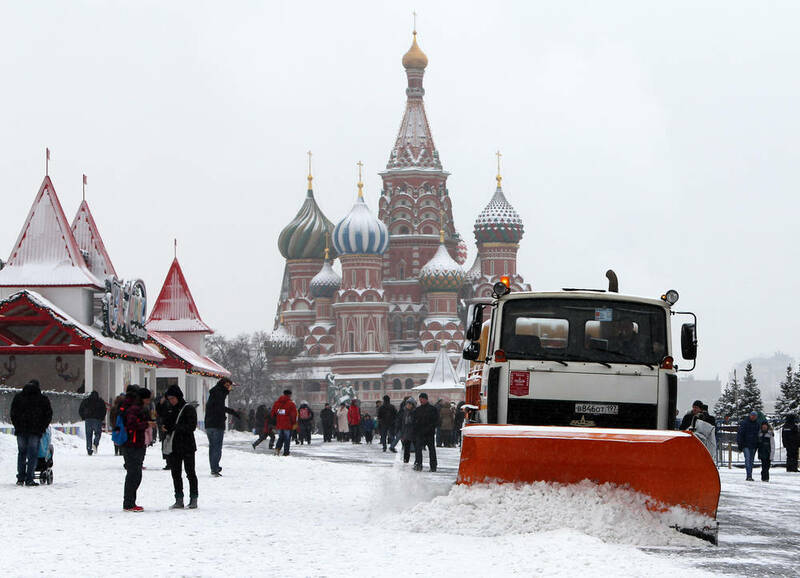 In the wintertime, a large ice rink is open to the public. 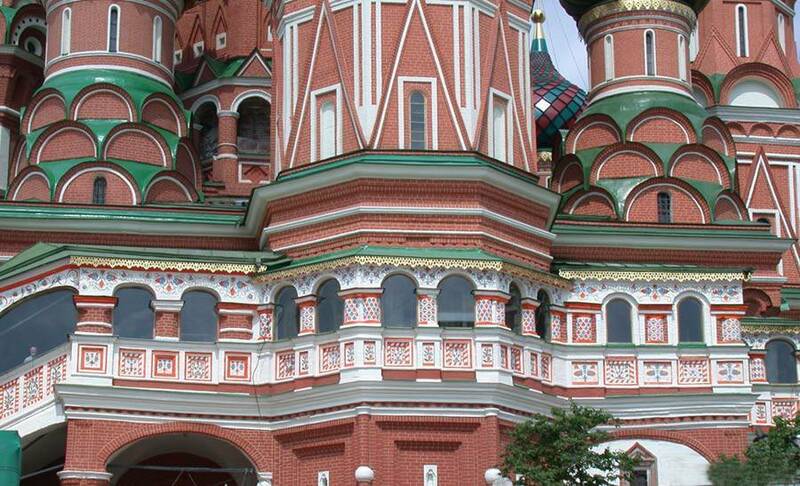 St. Basil’s Cathedral is the centerpiece of Red Square. 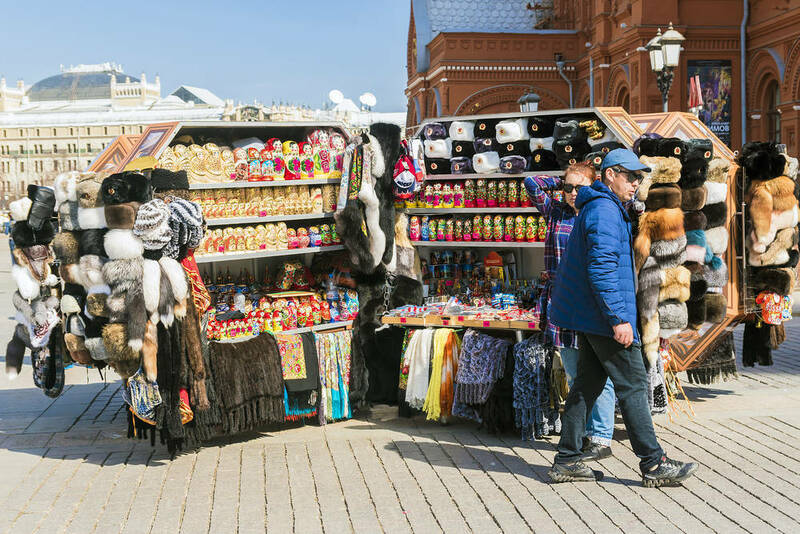 In the past, Red Square was covered by a sprawl of market stalls, which were later made more orderly in the late 16th century. 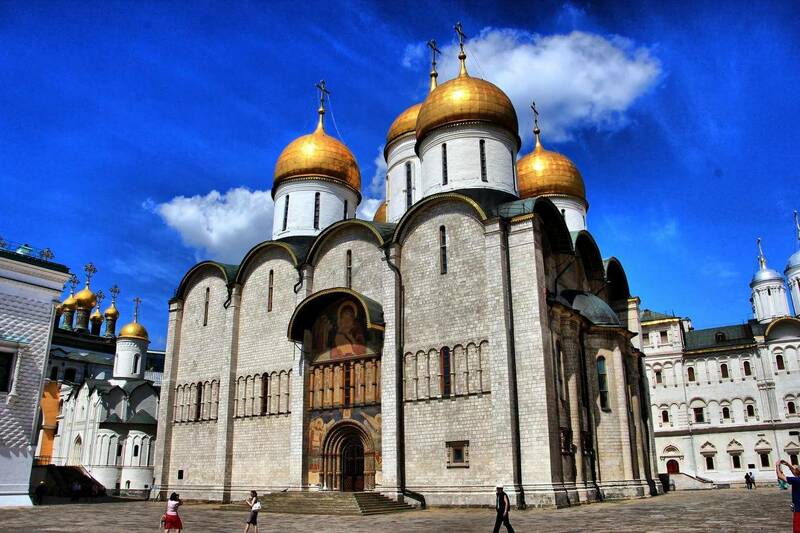 Commonly known as St. Basil’s Cathedral, the Cathedral of the Intercession also dates back to the 16th. 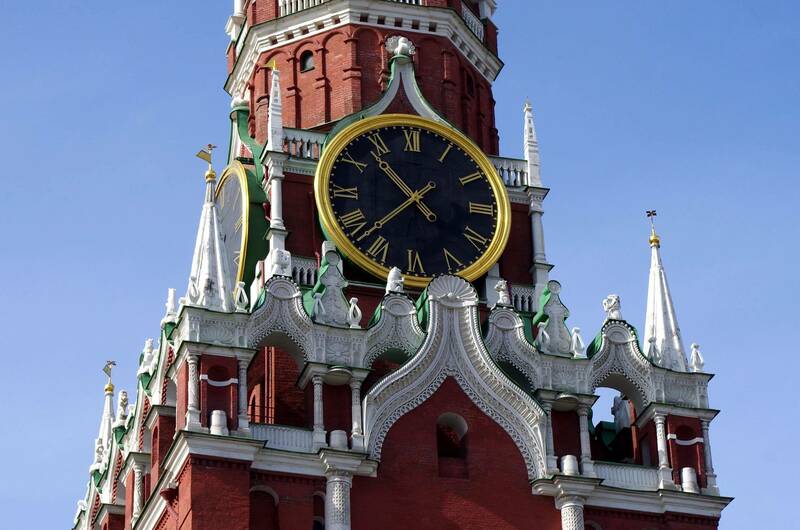 The Spasskaya Tower was added at a later date and the whole area near the tower and the cathedral was named Krasnaya (or ‘beautiful’ in old Russian) Square. 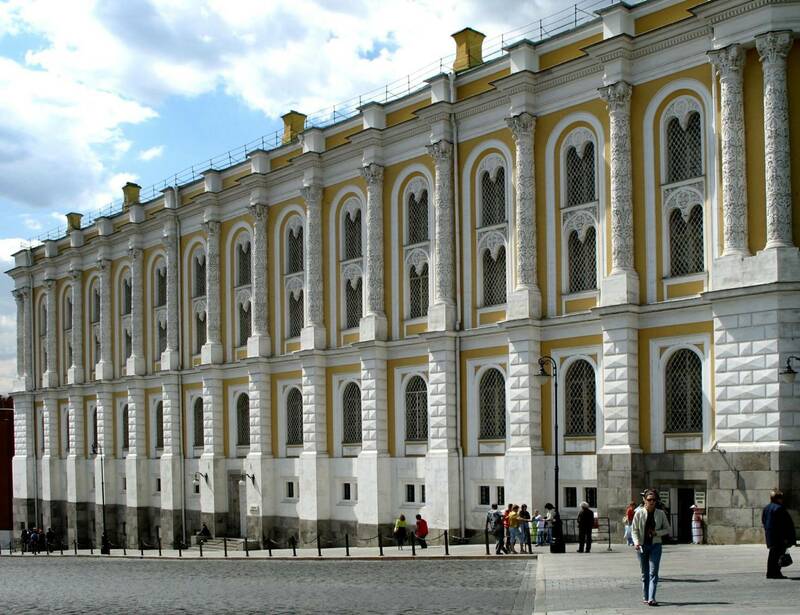 Today it is surrounded by the GUM (a large shopping centre), the Historical Museum and the Kremlin’s iconic walls and towers. 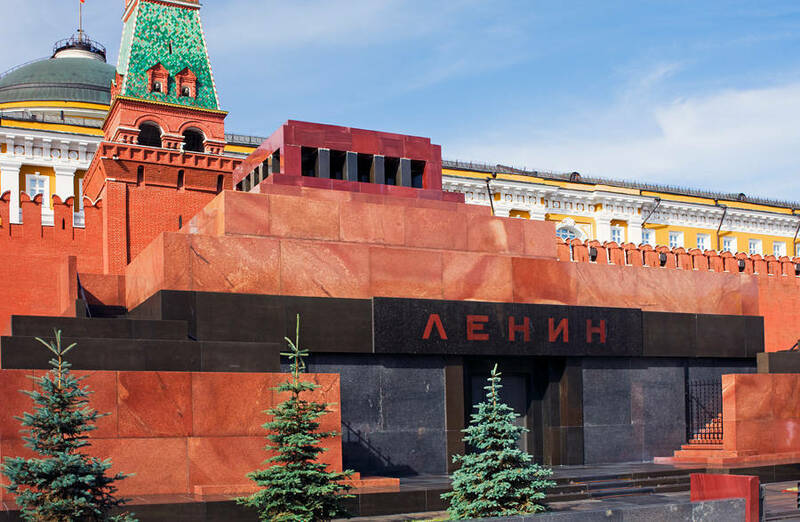 Located in the central part of Red Square near the Kremlin’s Senatskaya Tower, is the resting place of Soviet leader Vladimir Lenin. 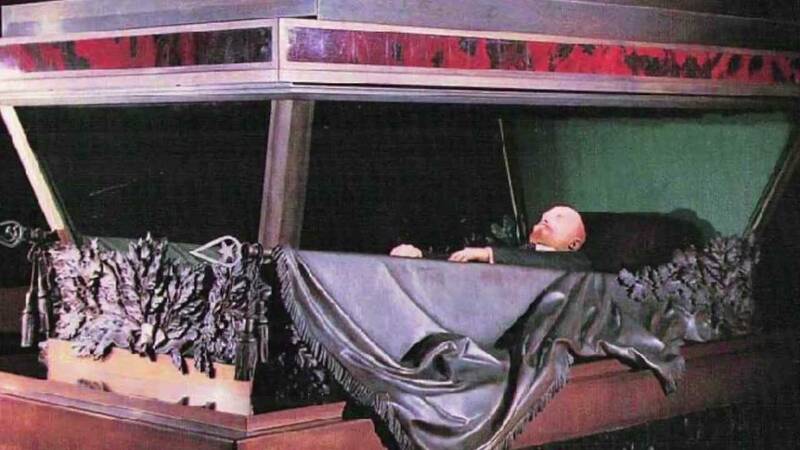 Political leaders used to stand atop Lenin’s Mausoleum (known as ‘Object No. 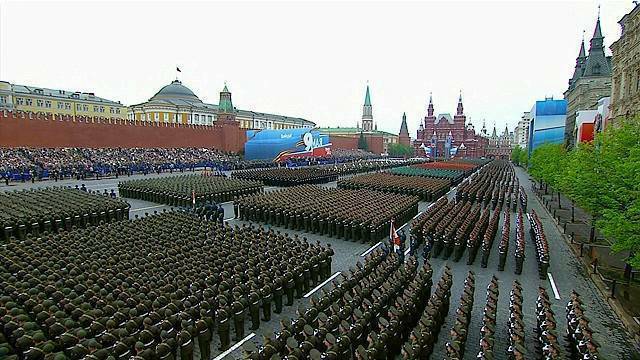 1’) to inspect military and celebratory parades back in Soviet times. 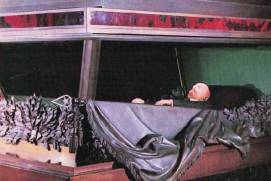 The mausoleum is still open to visitors. 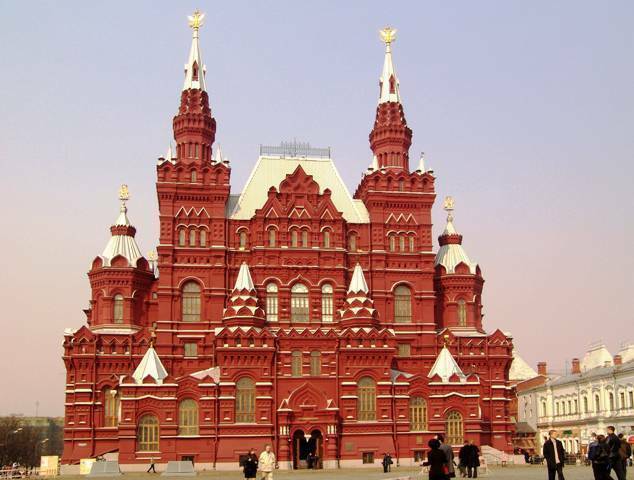 This 16th-century architectural monument, both a church and a museum, is the symbol of Moscow and the centerpiece of Red Square. 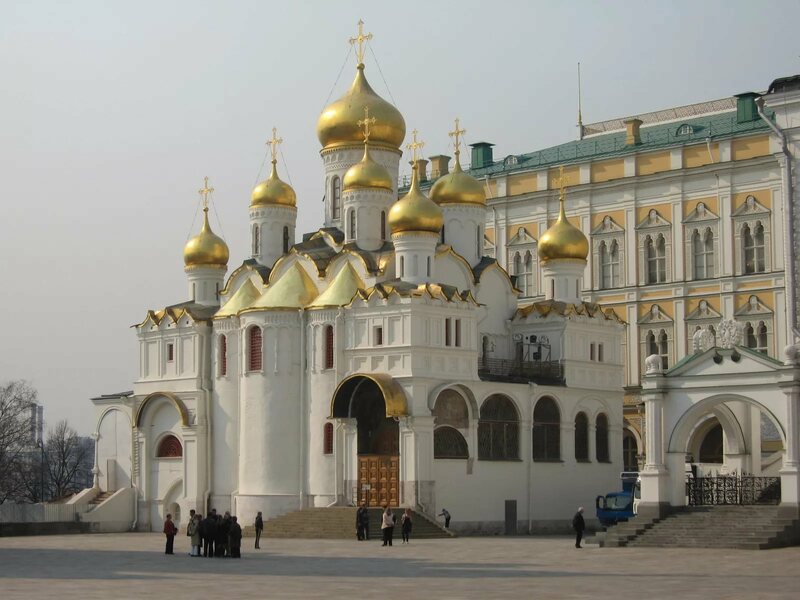 This astonishing nine-domed cathedral commemorates the victory of the Russian army headed by Ivan the Terrible over the Tatars. 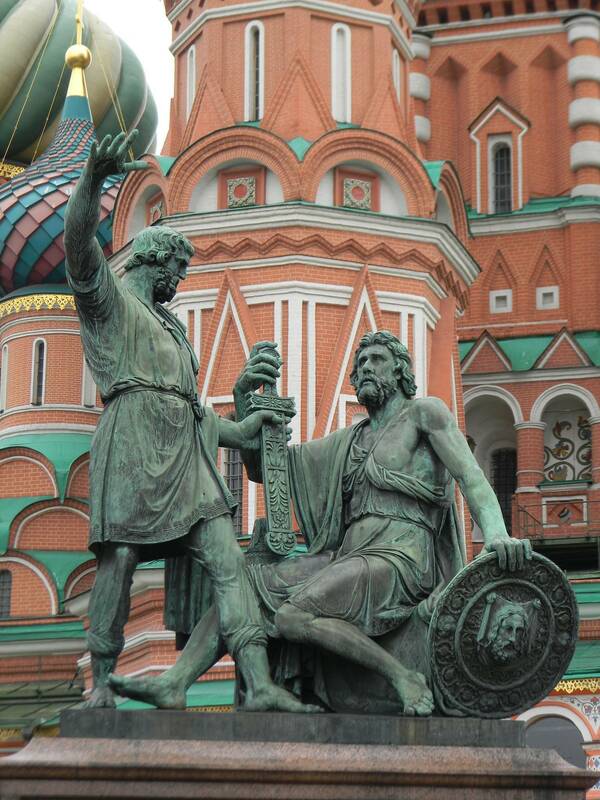 The conquest of Kazan was one of medieval Russia’s greatest military victories. 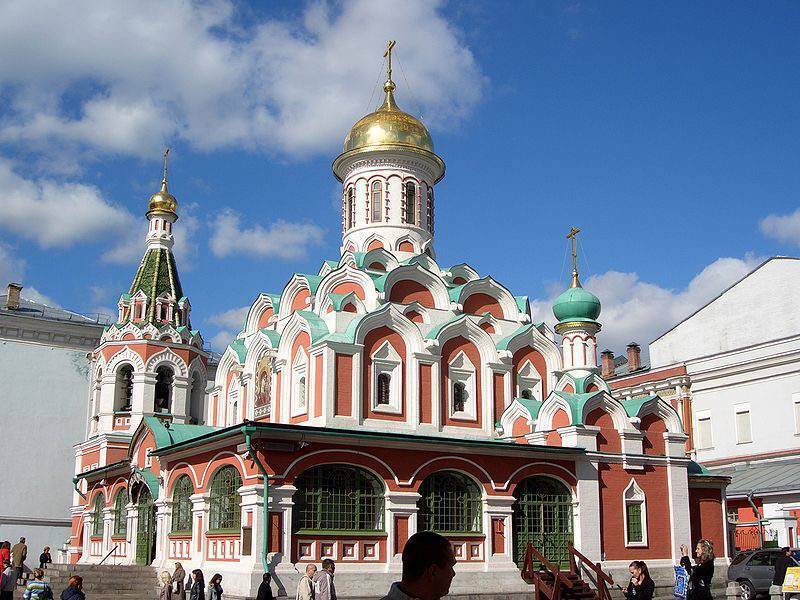 Situated on the corner of Nikolskaya Street and Red Square, this beautiful church is the surviving embodiment of the old Moscow way of life. The cathedral is open 24/7. 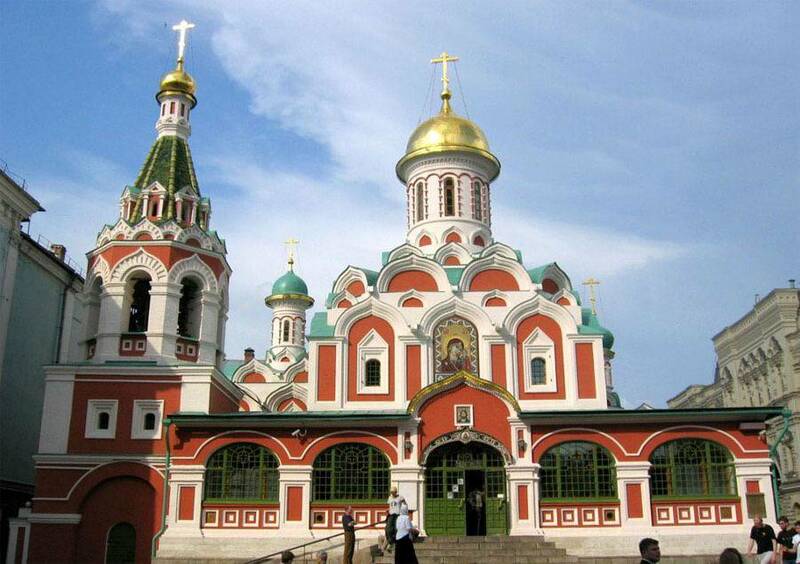 Russian Orthodox services are held here in the morning. 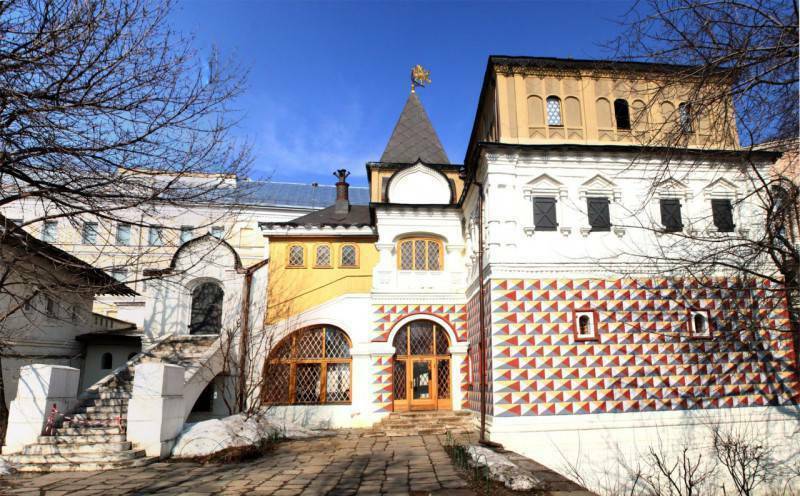 At the museum, you can learn all about history in Russia, starting from prehistoric times, the Bronze and Iron Ages; the Nomads and Ancient Russia; medieval Muscovy; the reforms carried out by Peter the Great; the glorious reign of Catherine the Great; and finally, early 20th-century Russia . 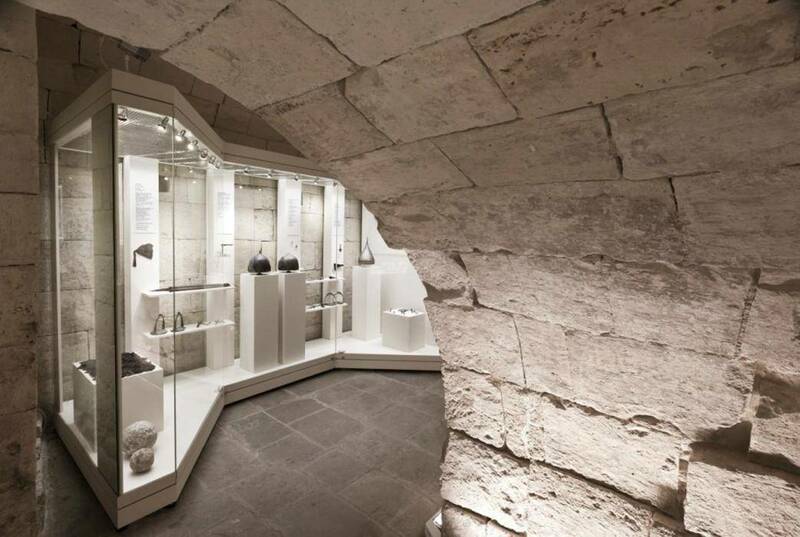 Be prepared to walk almost three kilometers if you want to visit the entire exhibition! 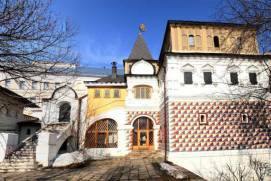 Its collection covers all periods of Russian history and that of the people inhabiting Russia. 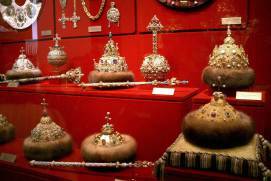 On display are decorations, pagan sculptures, manuscripts, weapons and clothing from different periods as well as the personal belongings of Russian emperors. 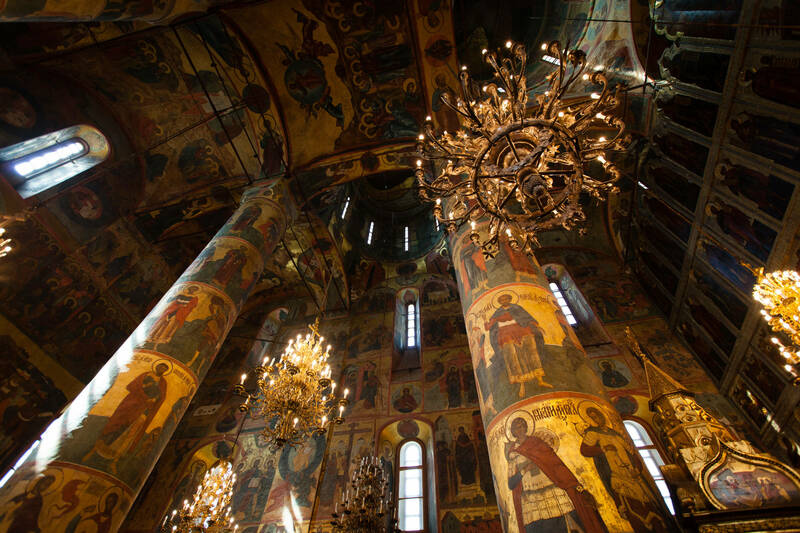 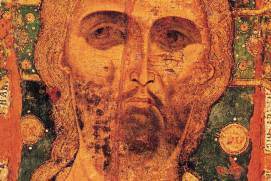 Besides ancient frescoes and icons, the Kremlin’s cathedrals display various historical exhibitions. As an example, an exhibition entitled ‘Treasures and Antiquities of the Moscow Kremlin’ is on display in the basement of the Cathedral of the Annunciation. 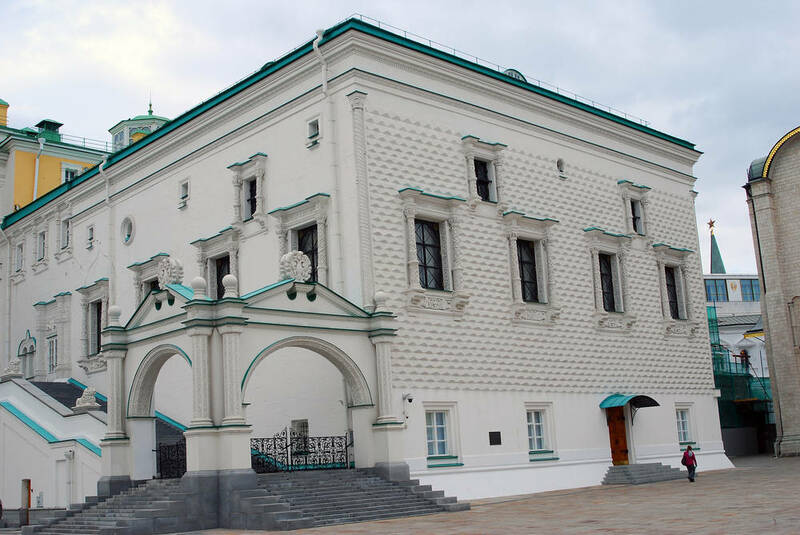 Constructed in the mid-19th century as a traditional Russian terem palace, it is now the official residence of the President of the Russian Federation. 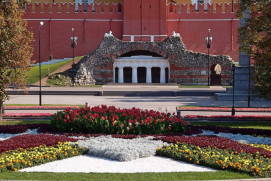 The Palace’s main façade overlooks the Kremlin Embankment. 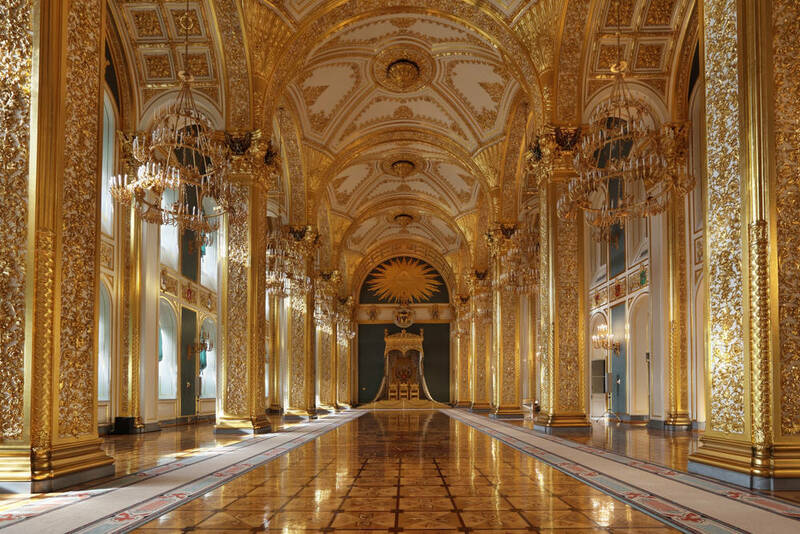 The Grand Kremlin Palace has five sumptuous reception halls. 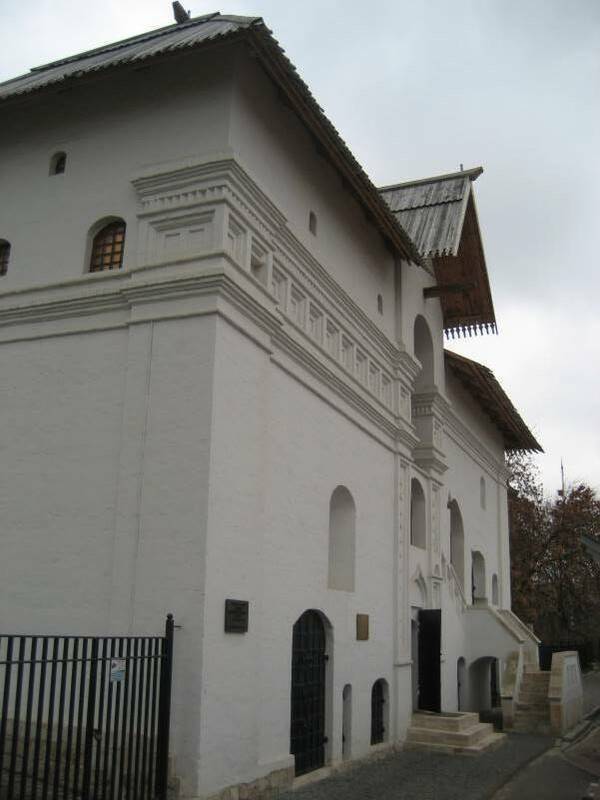 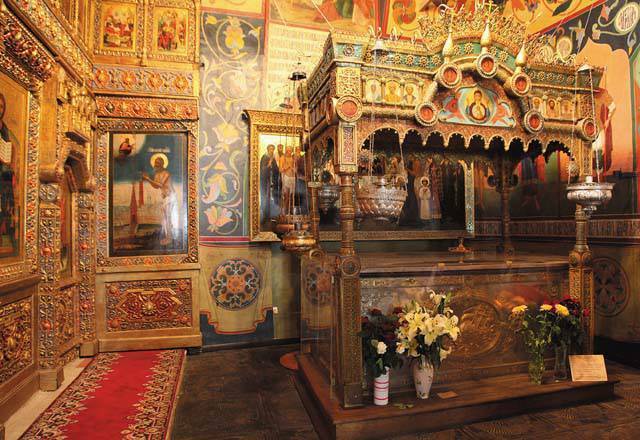 This museum occupies the Patriarch’s Palace and the Church of the Twelve Apostles. 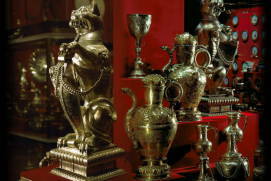 On display are icons, jewelry, books, embroidery and clocks. 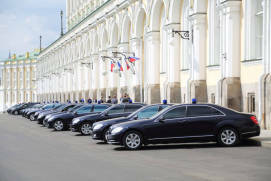 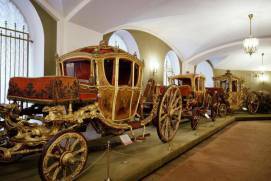 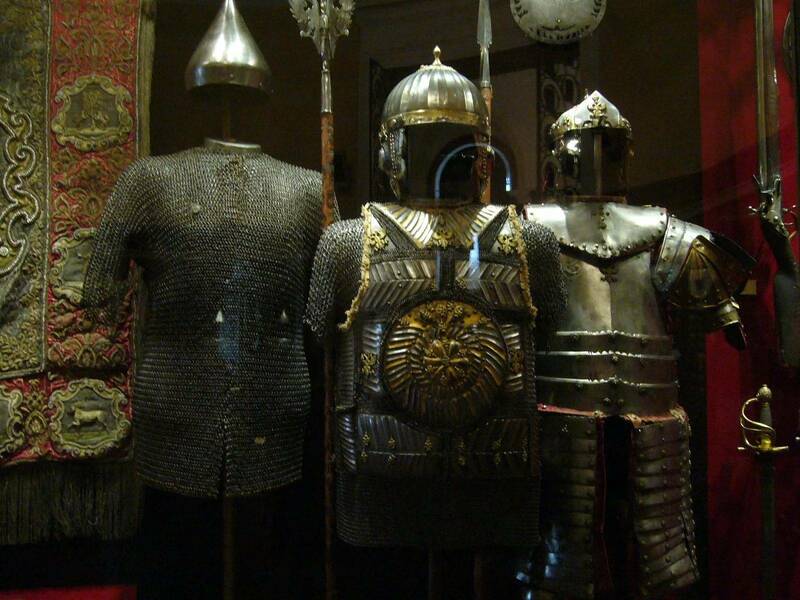 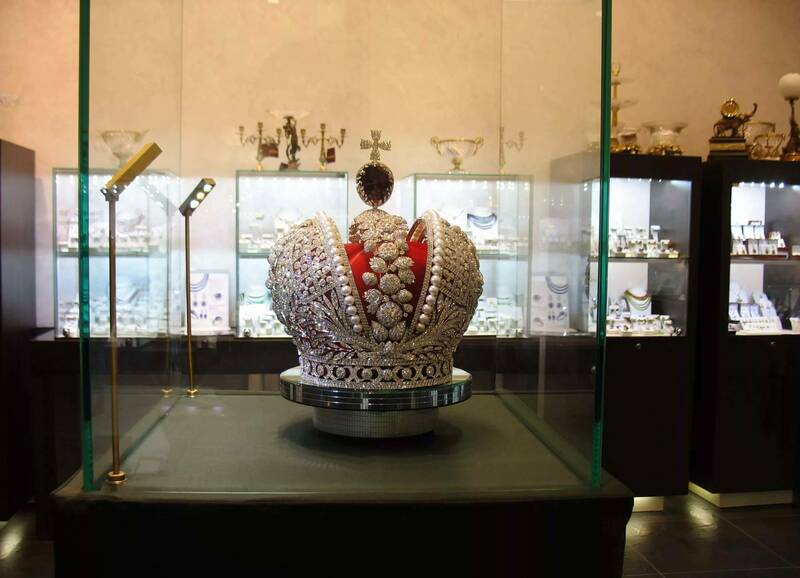 Among the best-known and exciting museums at the Kremlin are the Armoury and the Russian Diamond Fund. 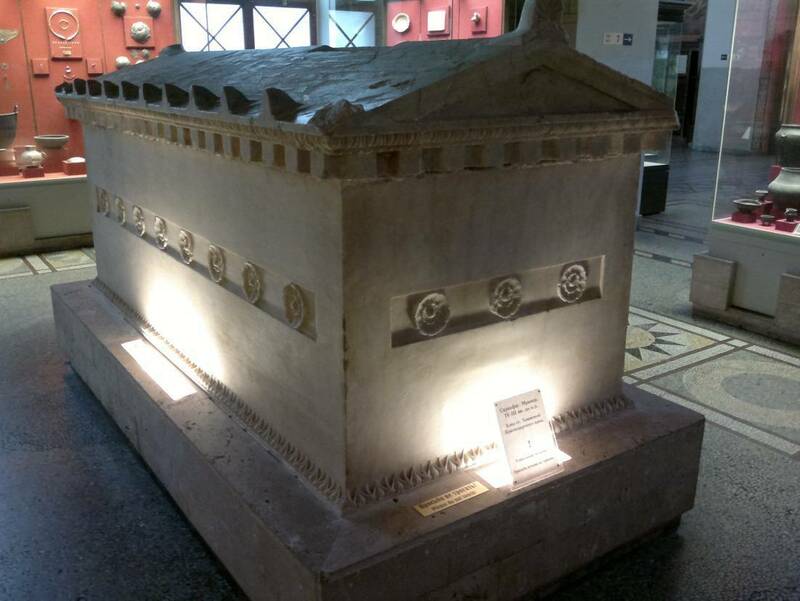 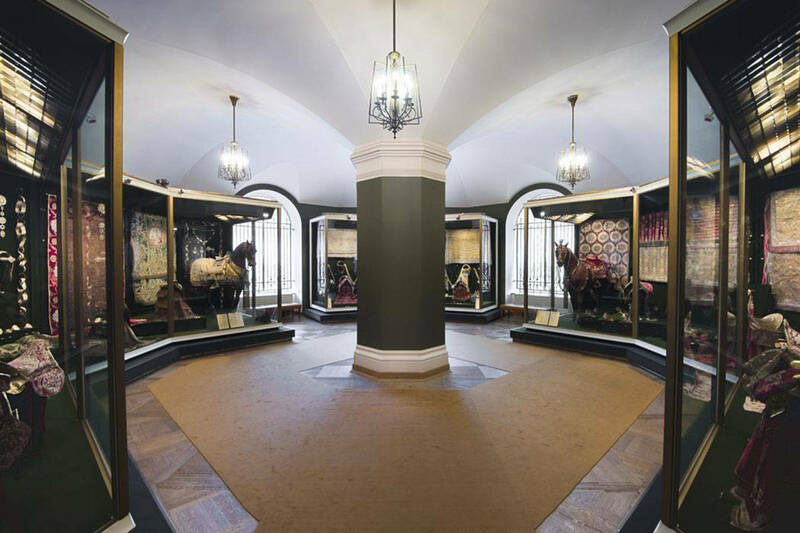 Every exhibit has a long history behind it, so they are much more than just collections of antiquities. 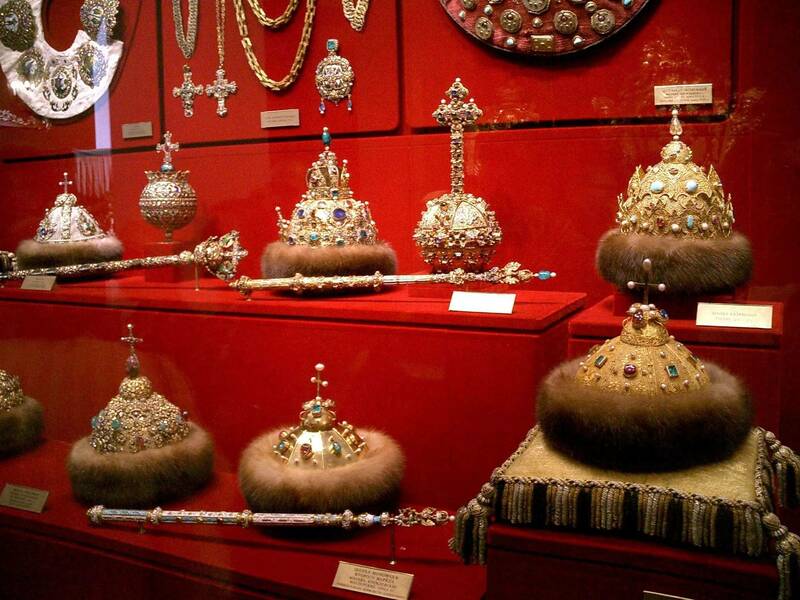 These museums contain imperial jewelry, authentic weapons owned by Russian princes, and numerous rarities from imperial treasuries. 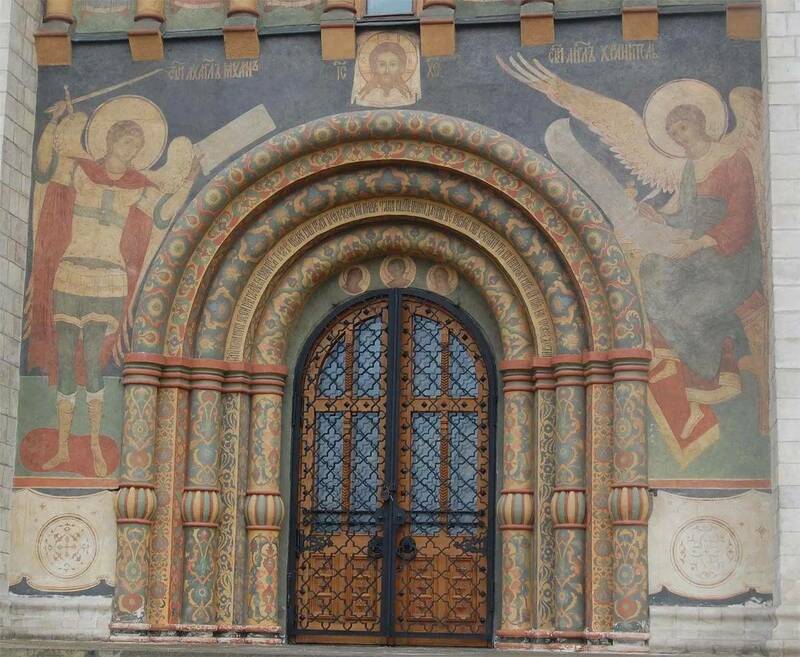 Every visitor will find something to be impressed with here. 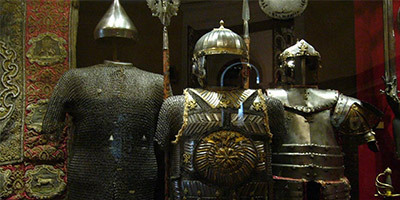 However, don’t just restrict yourself to these museums. 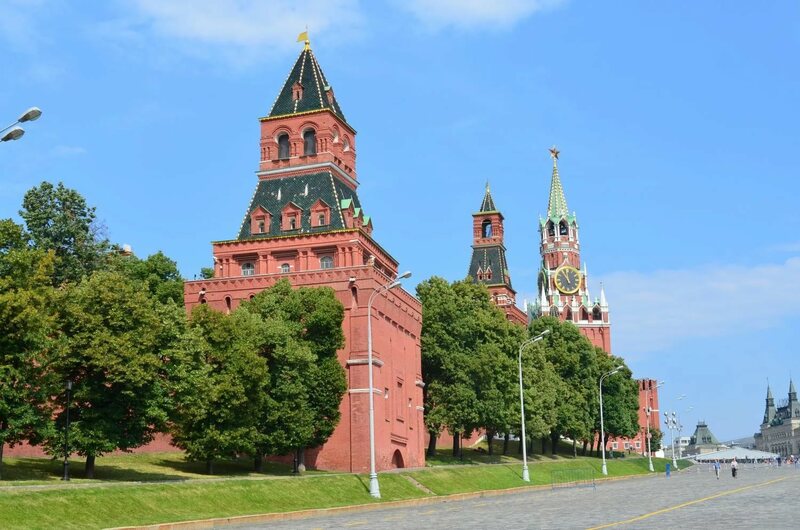 You may also want to visit the Kremlin’s cathedrals, and the Ivan the Great Bell Tower, to see the tower’s ancient bells and small exhibitions dedicated to the Kremlin’s history and architecture. 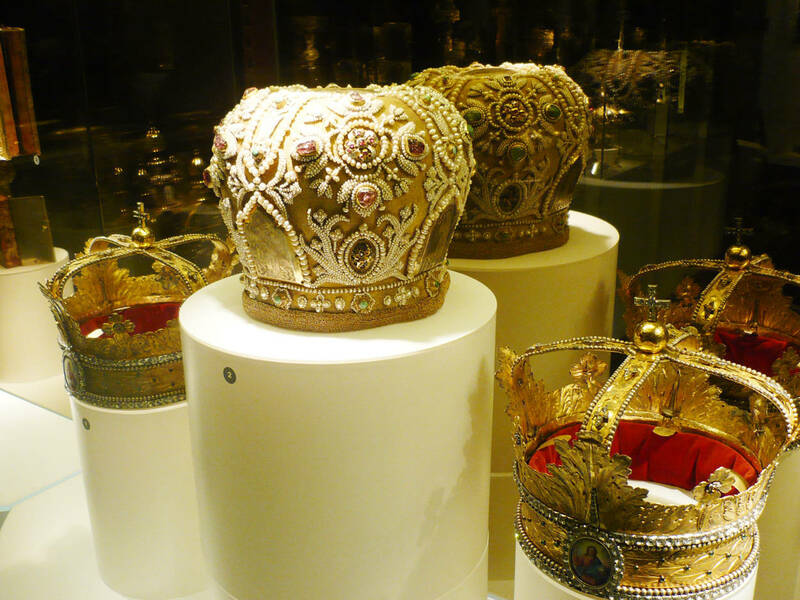 On display are authentic imperial regalia (Monomakh’s Cap, the scepter and the orb), imperial clothes (including those belonging to Emperor Peter the Great), carriages, European and Oriental old weapons, gold and silverware from the early 12th to late 20th centuries (including the world-famous Faberge Easter eggs) and so much more. 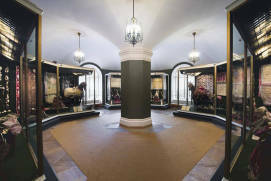 The museum has nine themed halls located on two floors. 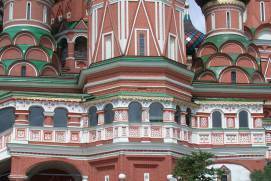 All the exhibits are presented bilingually in Russian and English. 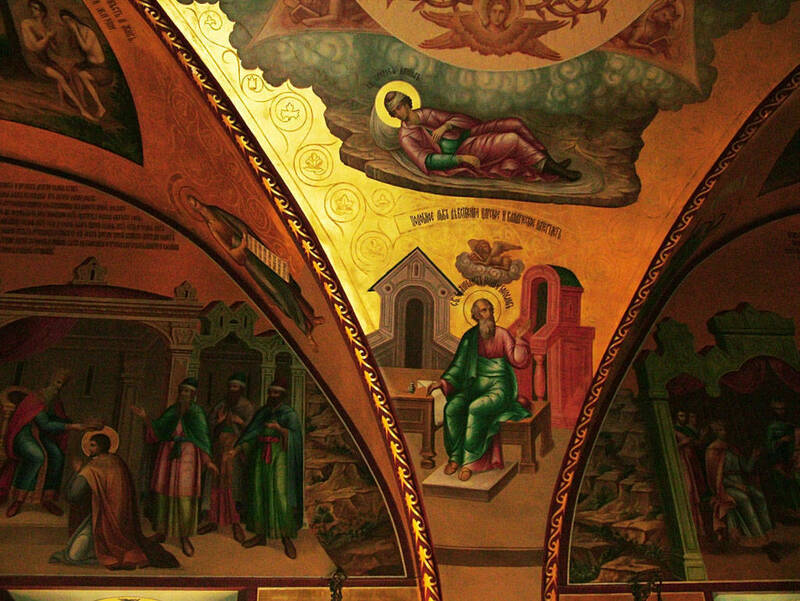 Audio-guides are also available. 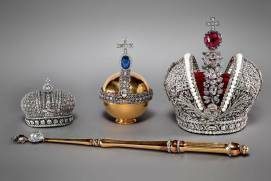 This museum’s collection consists mostly of breathtakingly beautiful jewelry from different periods, including its centerpiece – the Imperial Crown of Russia. 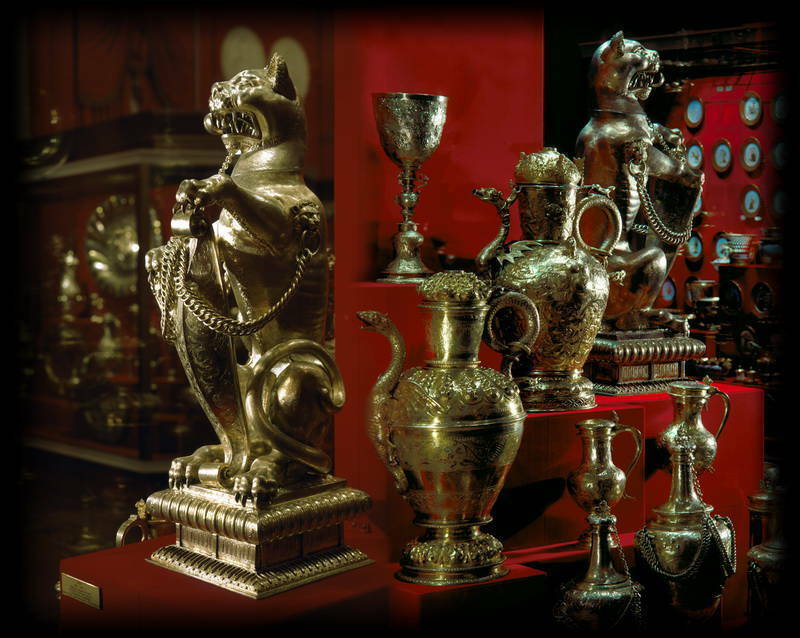 Other items on display include military decorations and imperial regalia, as well as large diamonds and gold and silver nuggets. 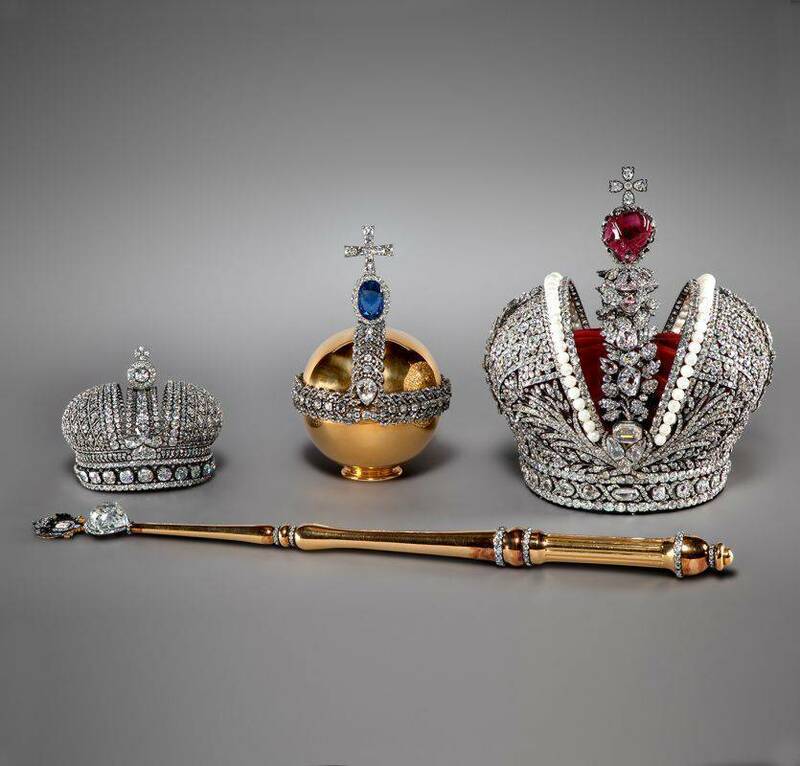 The jewels from the Fund’s collection allow visitors to trace the last 300 years of Russian history. 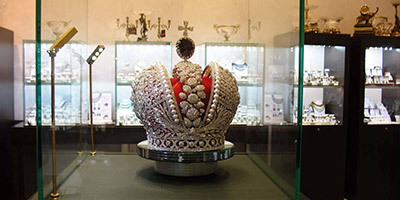 The Russian Diamond Fund is probably the most valuable museum collection in Russia, in terms of its uniqueness and the monetary value of its collection. 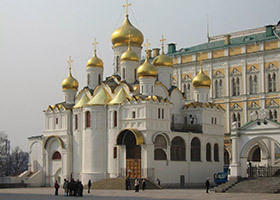 On the Kremlin’s main Sobornaya (or Cathedral), Square stand the Cathedrals of the Assumption, of the Archangel, and of the Annunciation as well as the Ivan the Great Bell Tower. 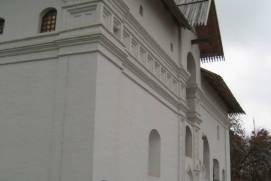 They were all built in the 15th and 16th centuries on the sites of old churches. 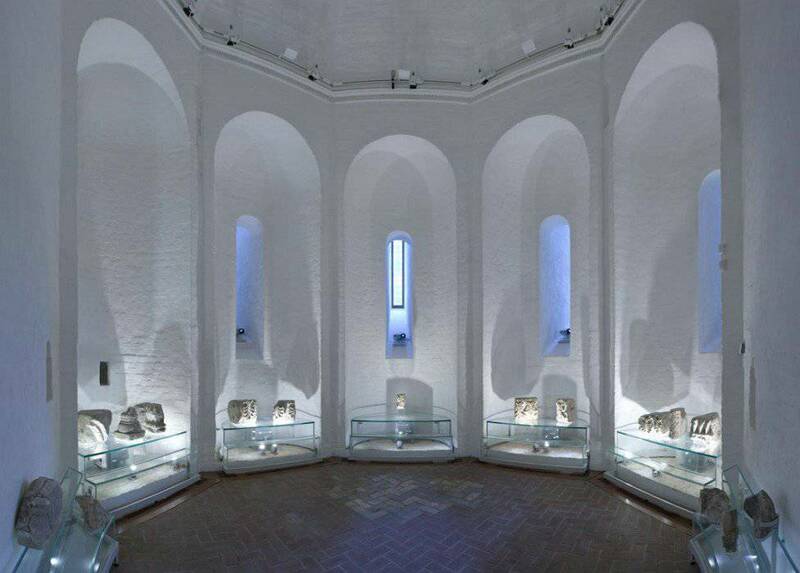 Today these cathedrals are also museums that are open to visitors. 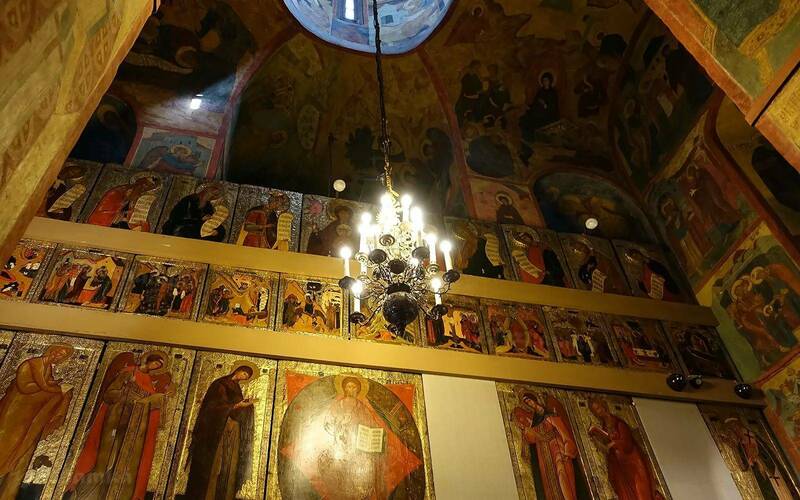 The various frescos and icons are well worth seeing, and you could also pay a visit to the historical exhibitions, including the tombs of many Russian tsars. 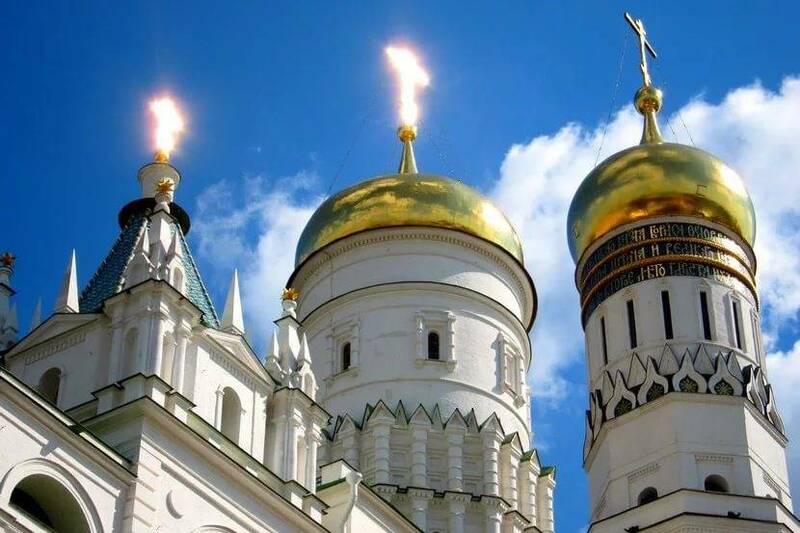 In the summertime, an observation platform on top of the Ivan the Great Bell Tower offers a breathtaking view of Moscow. 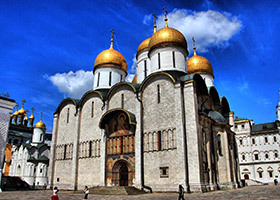 Located inside the Moscow Kremlin, the 15th-century Cathedral of the Assumption was the main Orthodox church of the Russian state between the 15th and the 19th centuries. 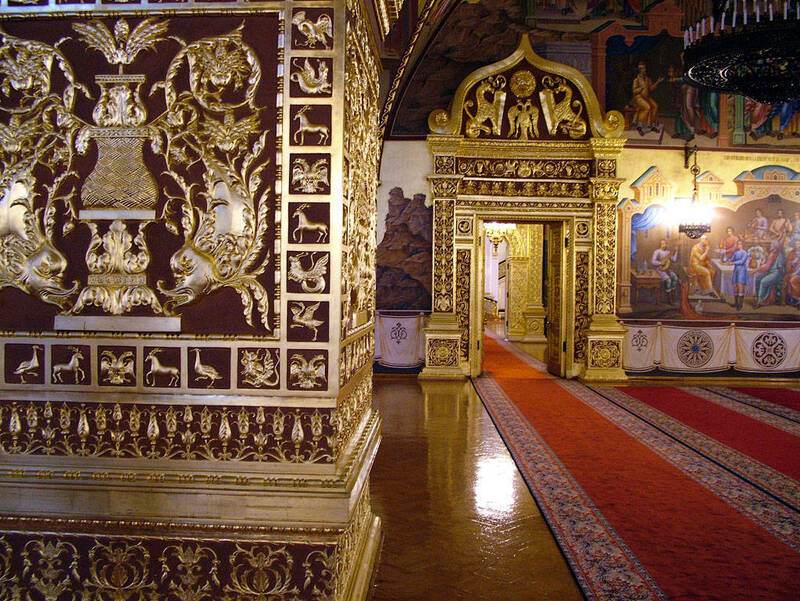 It was where the coronation of all the emperors from the Romanov Imperial House was held. 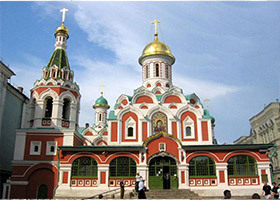 The Cathedral of the Assumption was the resting place of Moscow Metropolitans and Patriarchs. 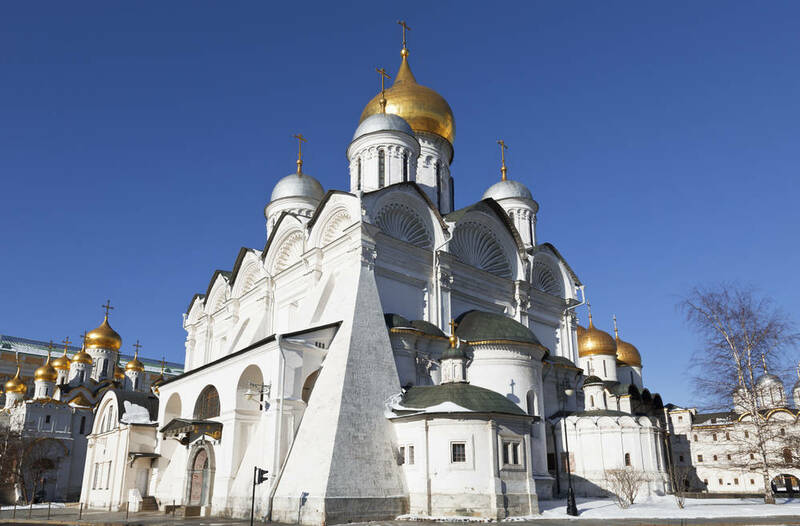 Built in the early 16th century, the Kremlin’s Cathedral of the Archangel was consecrated to Saint Michael the Archangel, seen as the leader of God’s army and the guardian of Paradise. 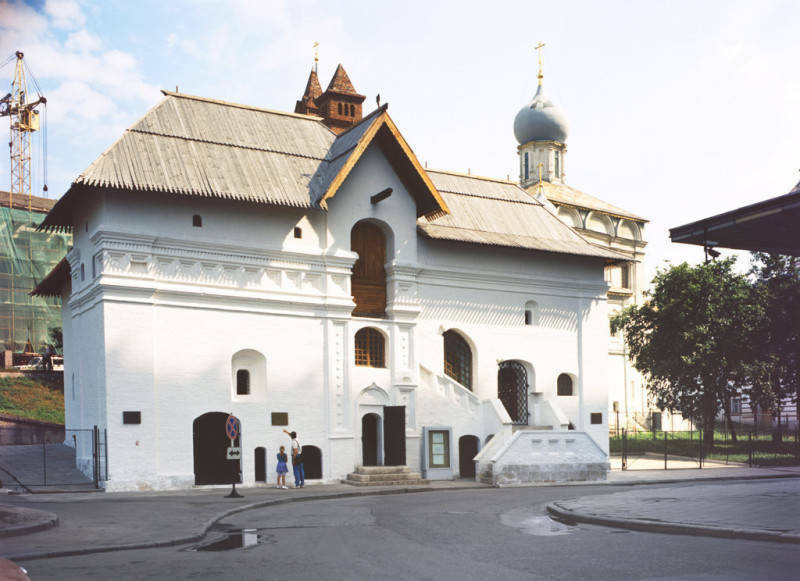 Historically, the church was used as a burial place for Moscow’s grand dukes. 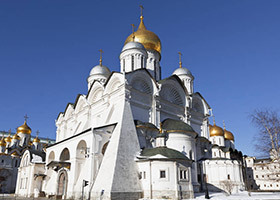 the Cathedral of the Annunciation, a building of white and gold, was built in the Kremlin as a church for Moscow princes. 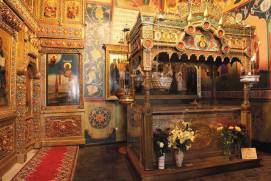 It was here that Russian tsars shared their confessions and had their children baptized. 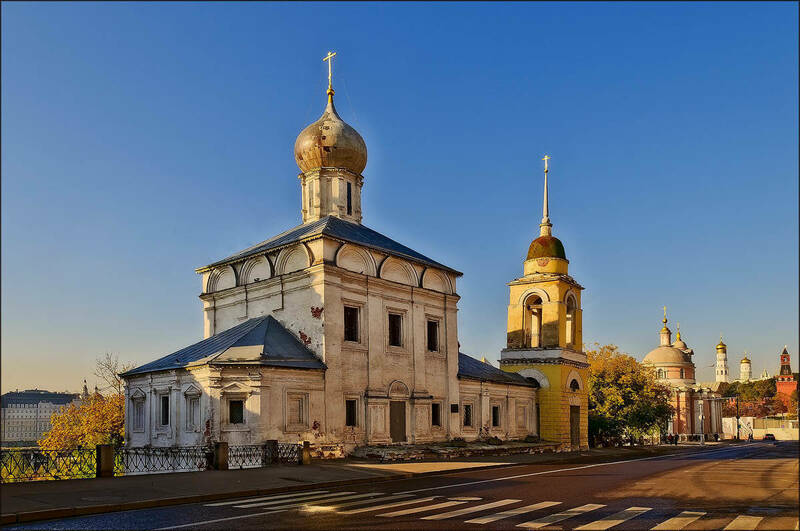 This perfectly preserved architectural landmark, and a fine sample of Russian church décor, dates back to the 16th century. 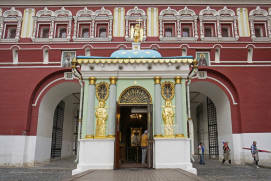 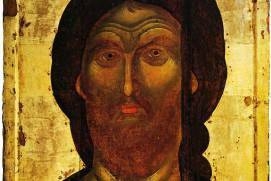 The Moscow Kremlin hides priceless treasures. 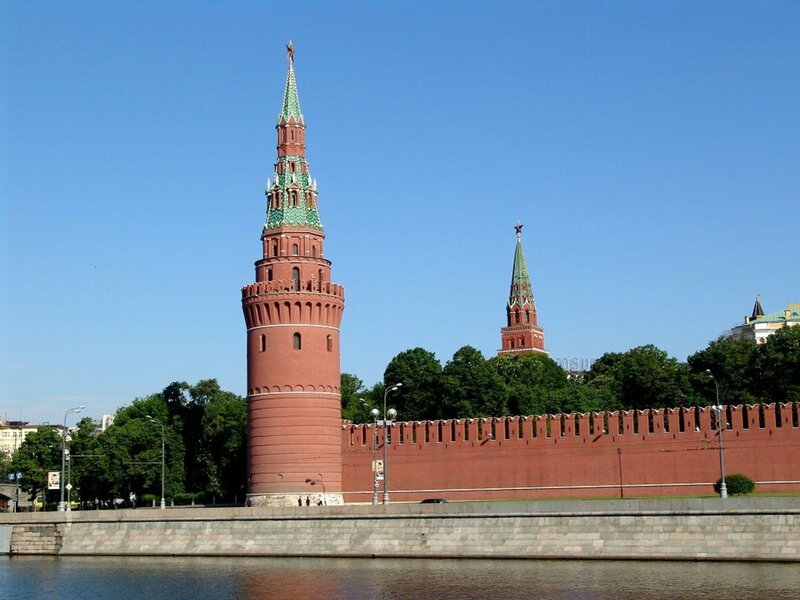 Almost every tower played a role in Russia’s rich history, whether as a battle towers, prisons, or other facilities. 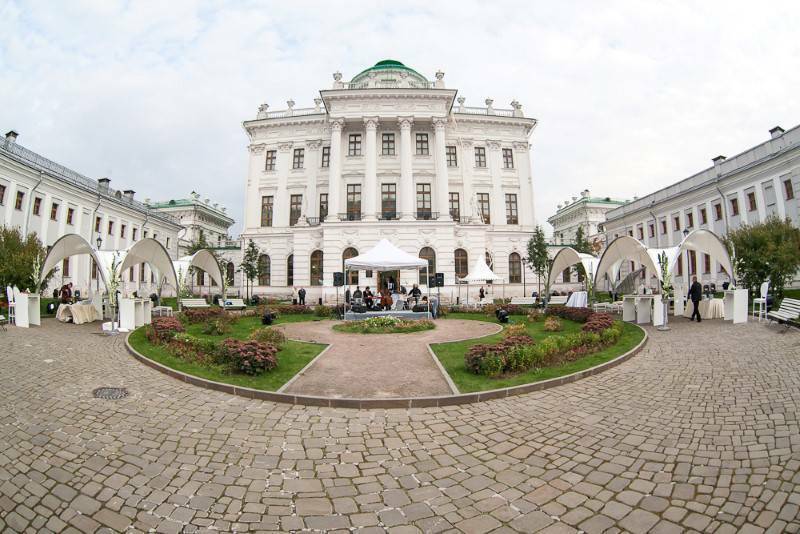 The Palace of the Facets and the Terem Palace have an architectural perfection that defies imagination. 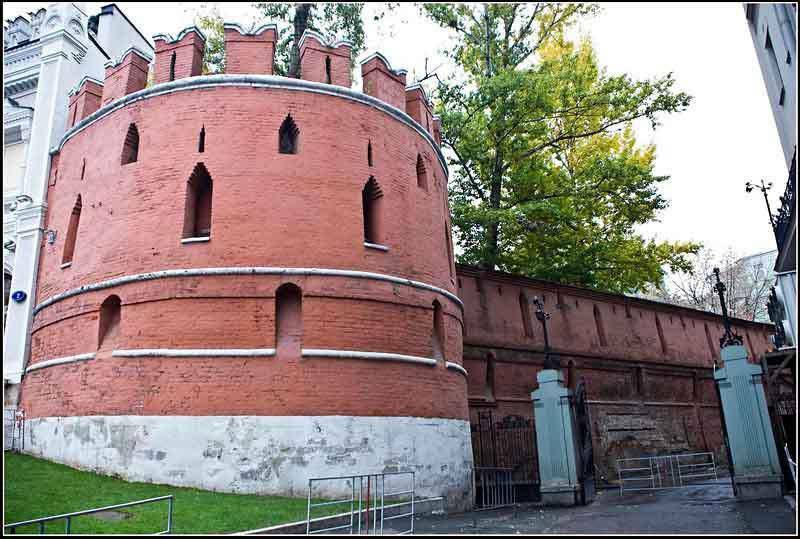 Don’t miss some real treasures right behind the Kremlin’s walls, including a giant bell and cannon. 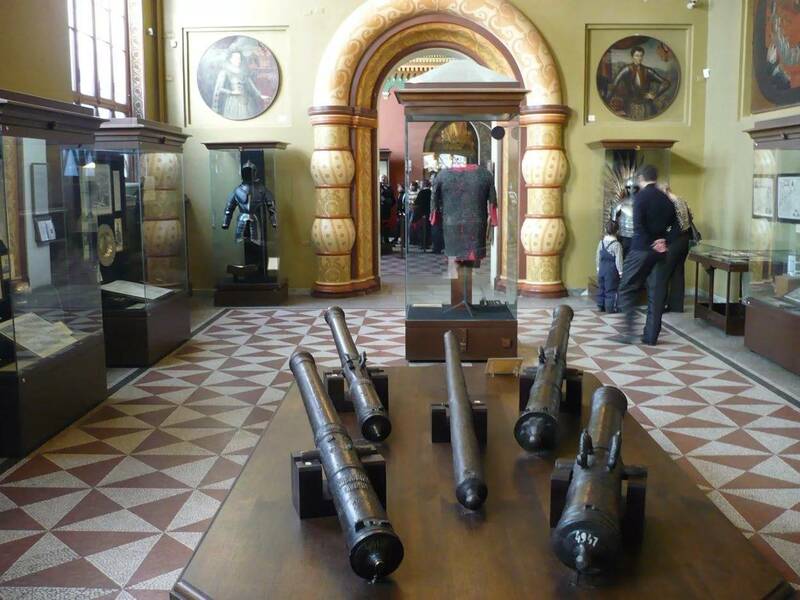 A sample of the Russian artillery, this cannon was cast in bronze in 1586. 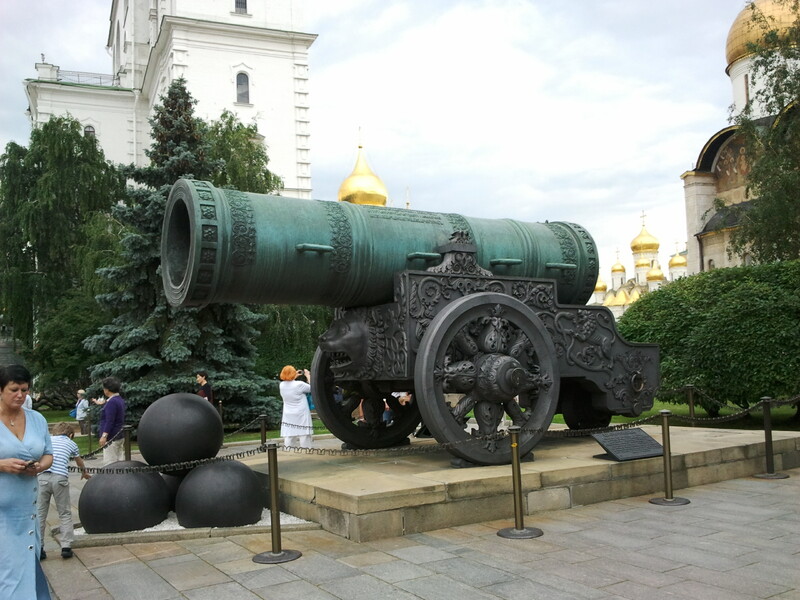 Decorated with delicate reliefs and inscriptions, this giant cannon fired just once, although it has guarded Red Square for many years. 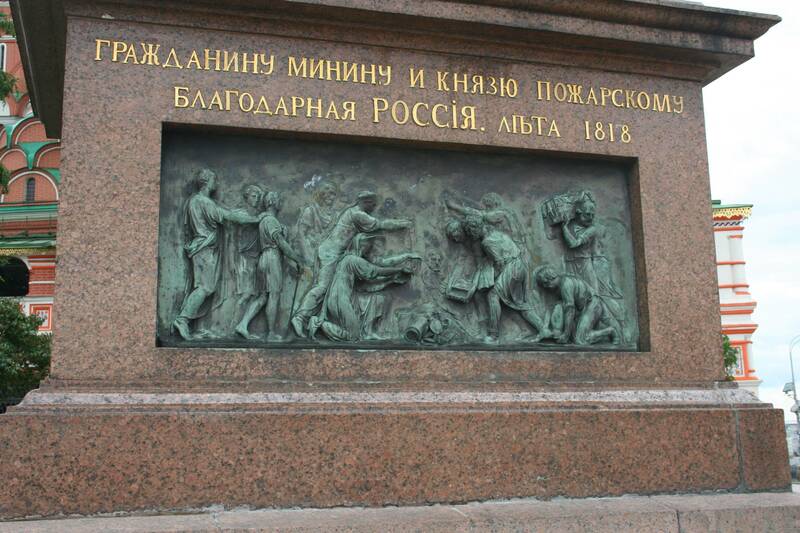 This 200-ton giant, whose sound has never been heard by anyone, was commissioned in the 18th century by Empress Anna of Russia to keep the memory of her reign for future generations. 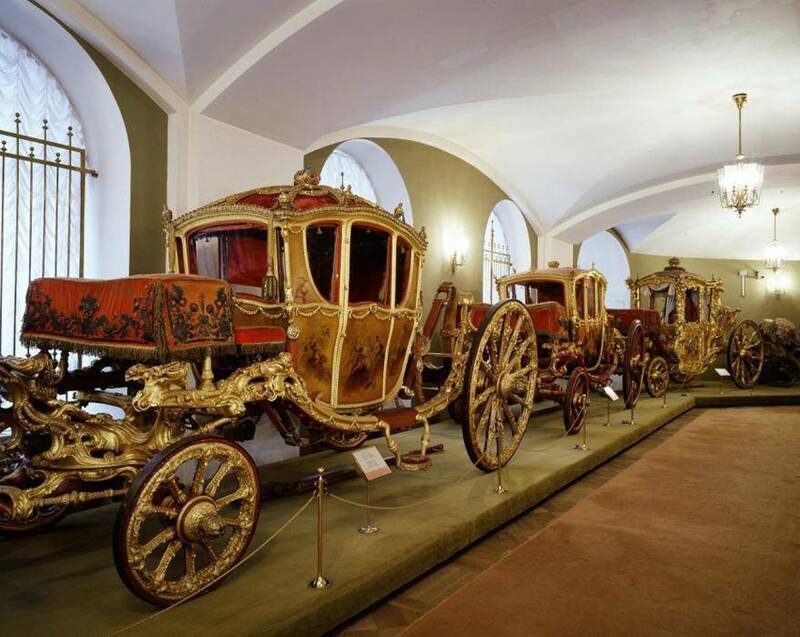 Built in the late 15th century by Italian architects, this palace served as the grand reception hall of the grand ducal residence. 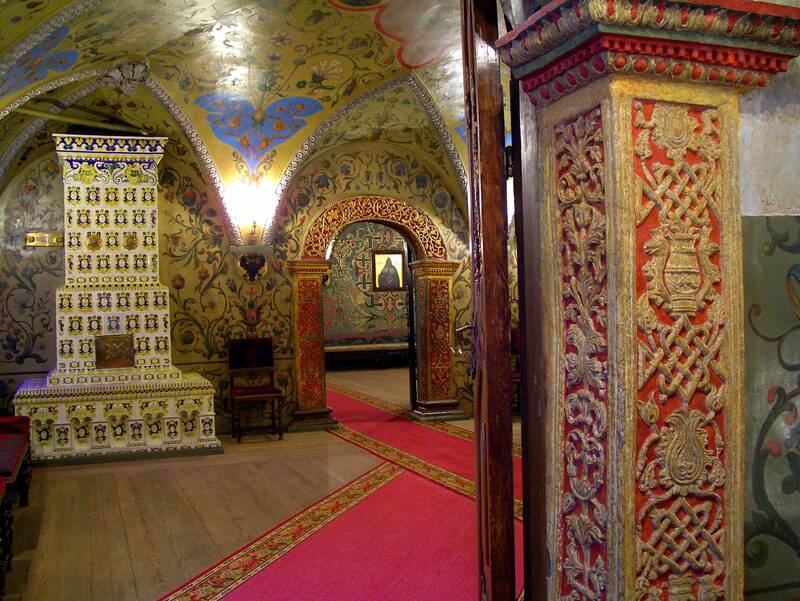 Its walls and vaults were covered with inspiring frescos in the 16th century. 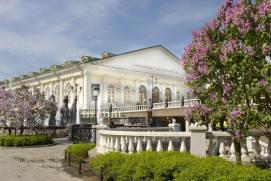 The Kremlin is easy to access and offers all of the amenities visitors need for a great trip to Moscow’s city centre. 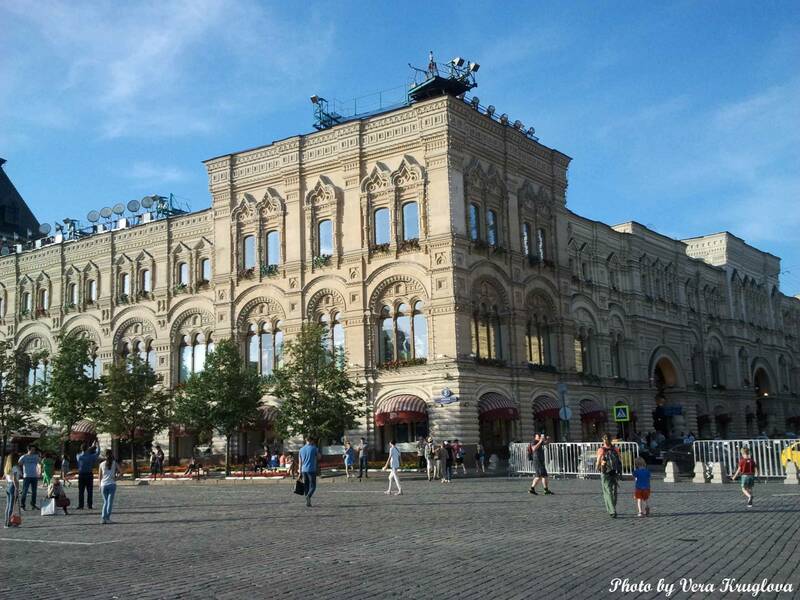 There are many places around Red Square to rest and enjoy a delicious meal. 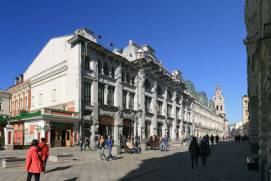 The closest cafés are located on the second floor of the GUM department store. 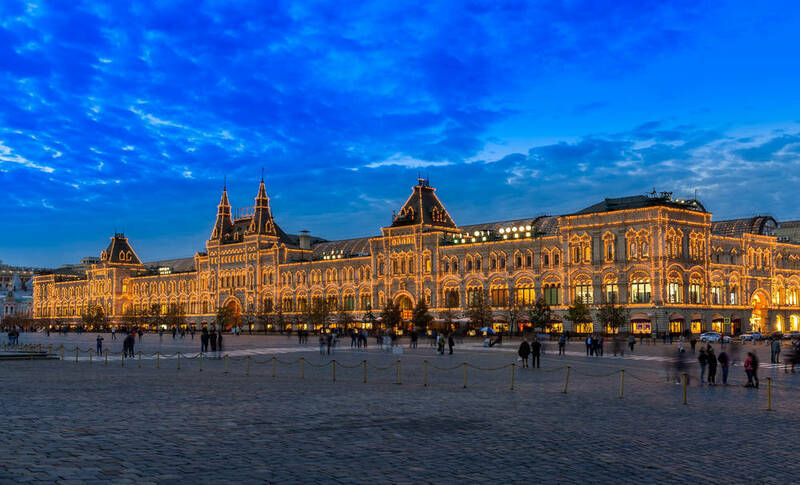 During the warm season, visitors to Moscow can enjoy a great meal right on the veranda overlooking Red Square (be ready to pay, though!). 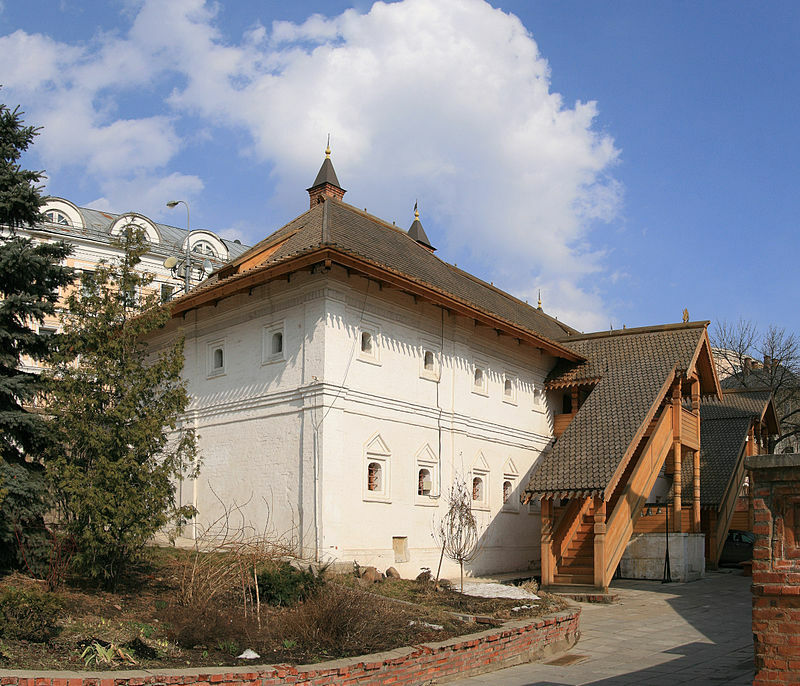 Several fast food stores are also available in the Alexander Garden and in the Kremlin. 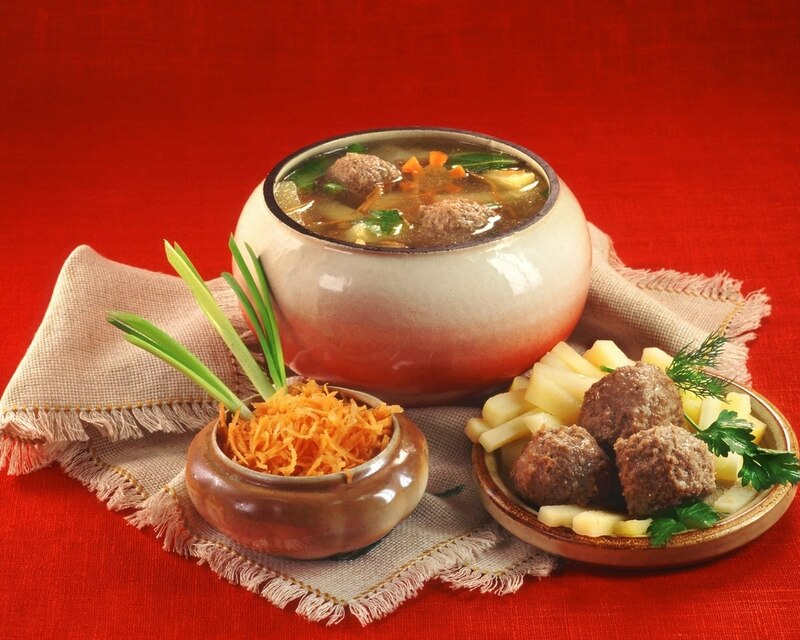 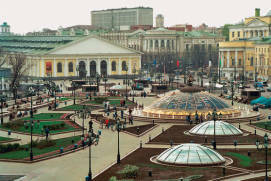 Italian, Russian and Japanese restaurants, as well as McDonald’s, are located in the Okhotny Ryad Shopping Mall just outside the Alexander Garden. 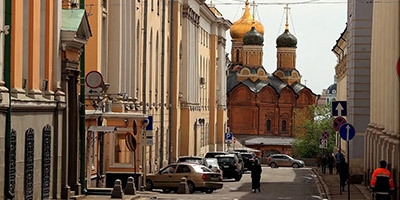 Restaurants and chain cafés just around the corner – on Nikolskaya and Ilyinka Streets – offer reasonably priced breakfasts and lunches. 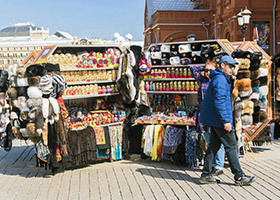 You can buy souvenirs and other items just outside the Iberian Chapel, on the square in front of the Museum of the Patriotic War of 1812, or in a small shop inside the Historical Museum. 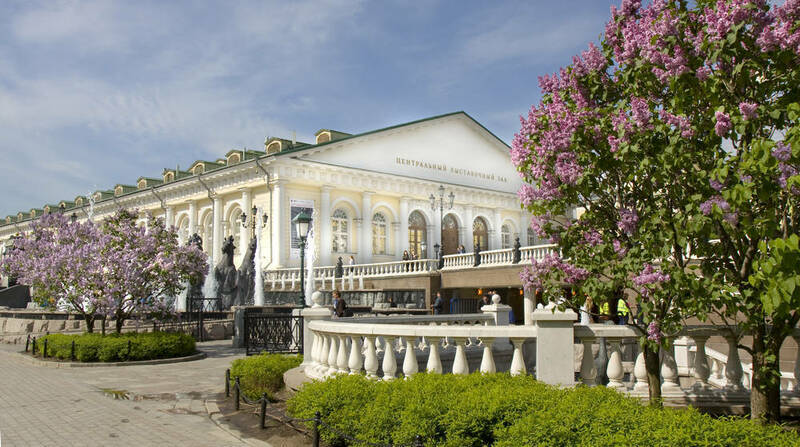 Those with a taste for fashion and luxury will enjoy the world-famous GUM, open in daytime and in the evening. 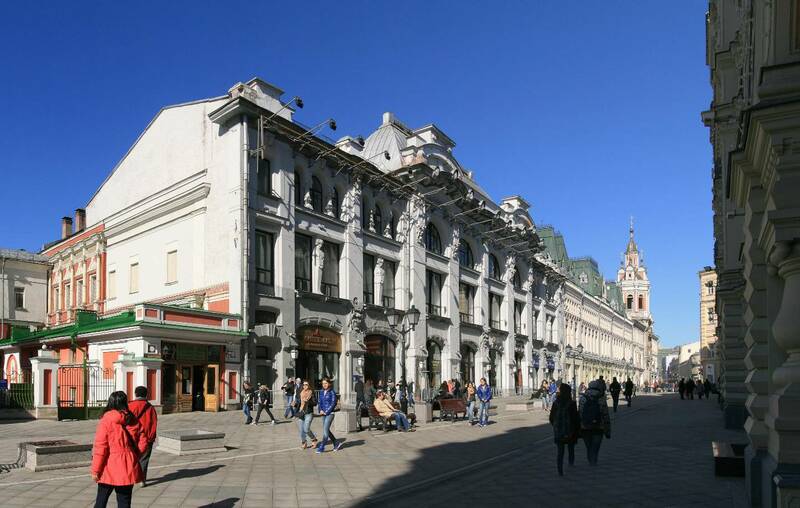 Don’t forget to visit Gostiny Dvor, a large shopping mall and exhibition space located on Ilyinka Street. 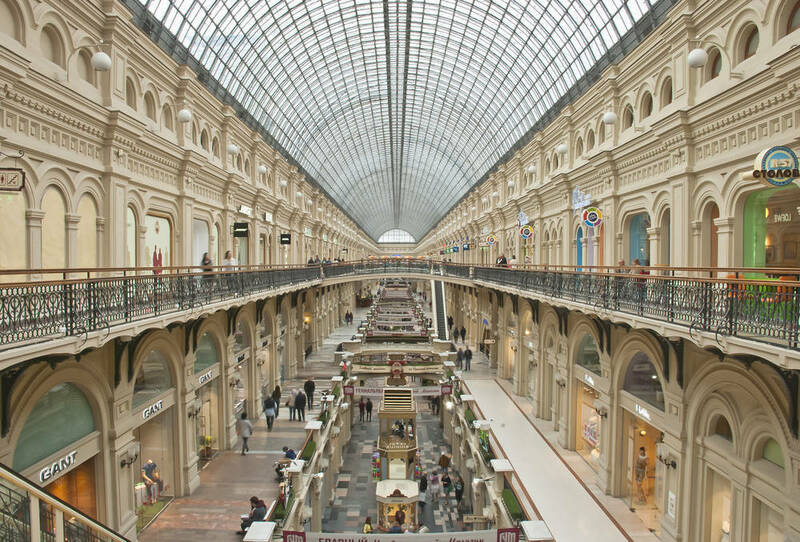 All of these malls have shops selling souvenirs. 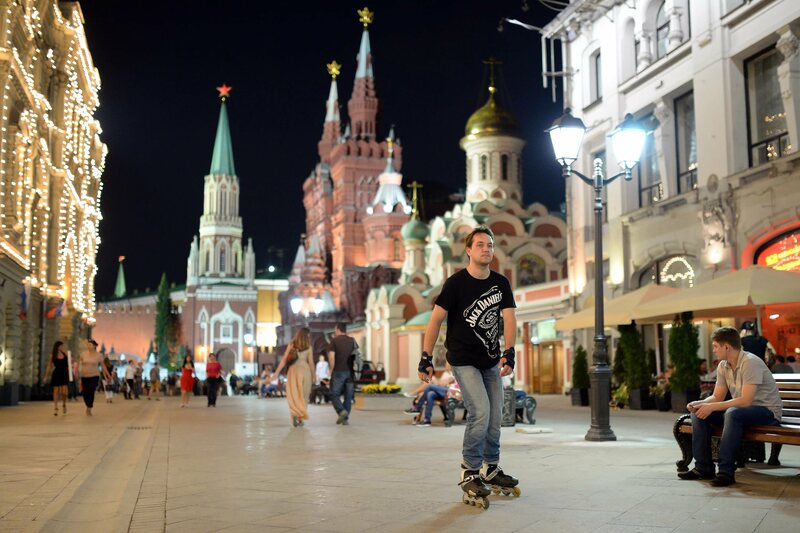 Keep in mind, though, that prices in this part of Moscow are often sky-high. 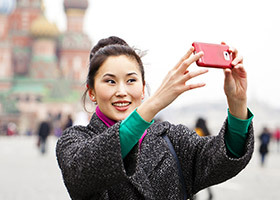 You don’t need to speak Russian to visit the Kremlin and Red Square. 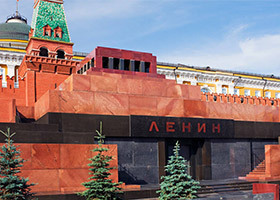 In all of the Kremlin’s museums, visitors are offered guided tours in English, German, French, Spanish and Italian, and multilingual audio-guide are available too. 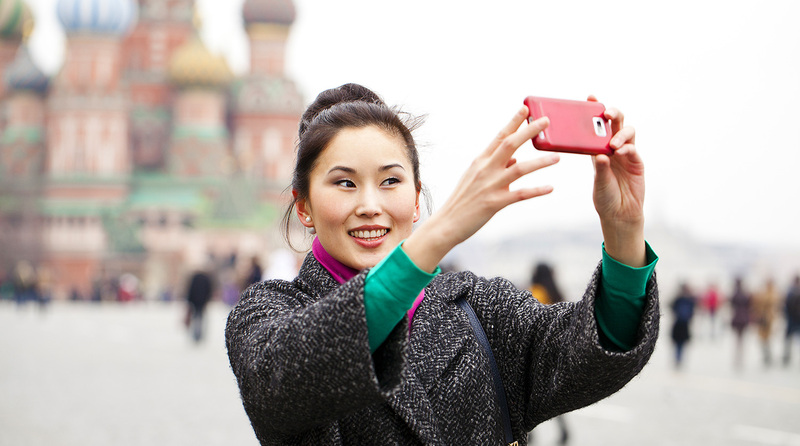 The Kremlin and Red Square are Moscow’s most accessible landmarks for foreign visitors. 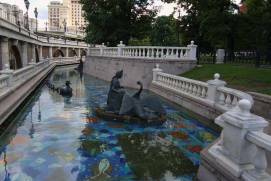 The area features street signs in English, and nearby metro stations are all equipped with translated maps and directions. 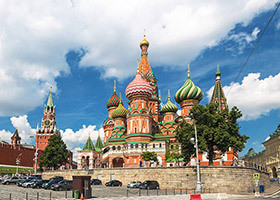 Historically, ‘Krasnaya Ploshchad’ (Red Square) actually meant ‘Beautiful Square’, so the commonly used English translation – ‘Red’ Square – is not completely accurate. 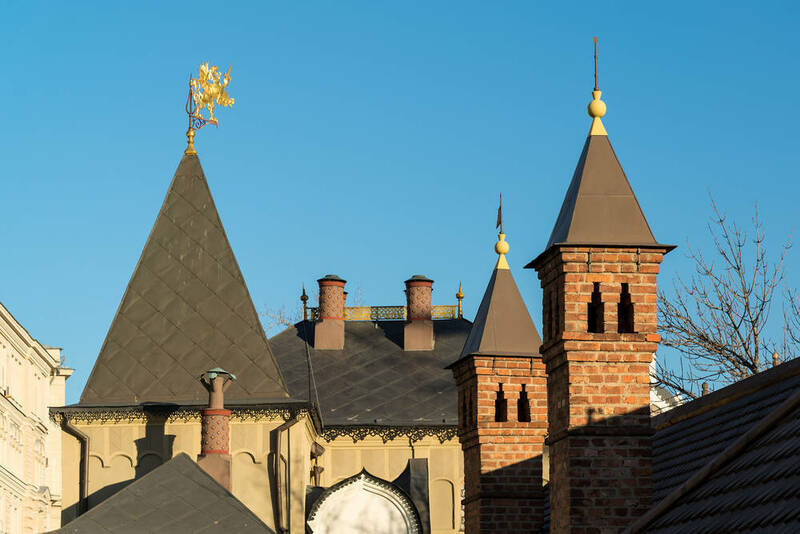 Indeed, this landmark is as beautiful today as it was in the past. 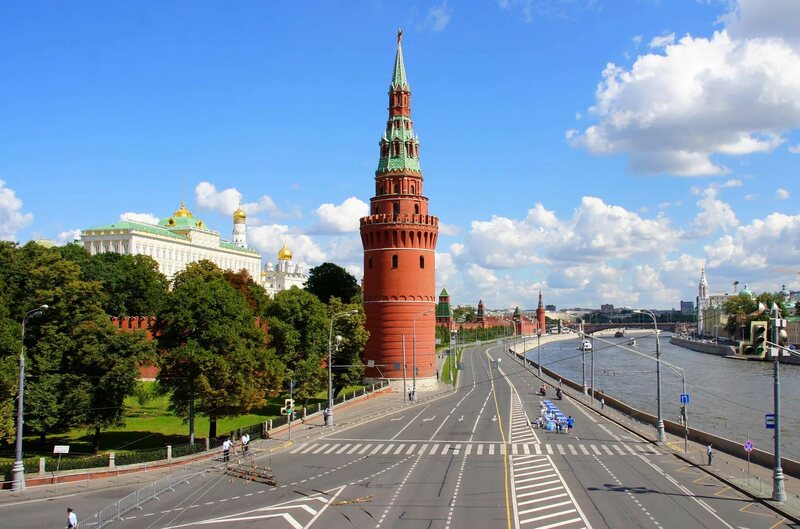 The Kremlin’s location on a high river bank, free from high-rise buildings, is guaranteed to make a lasting impression and offer plenty of photo opportunities. 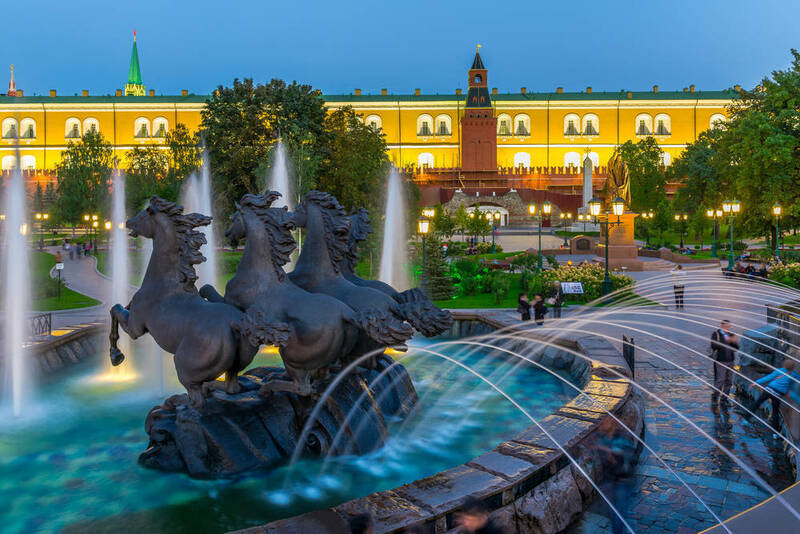 To the northwest of the Kremlin, the Alexander Garden has been a favourite place among both Muscovites and visitors for many years. 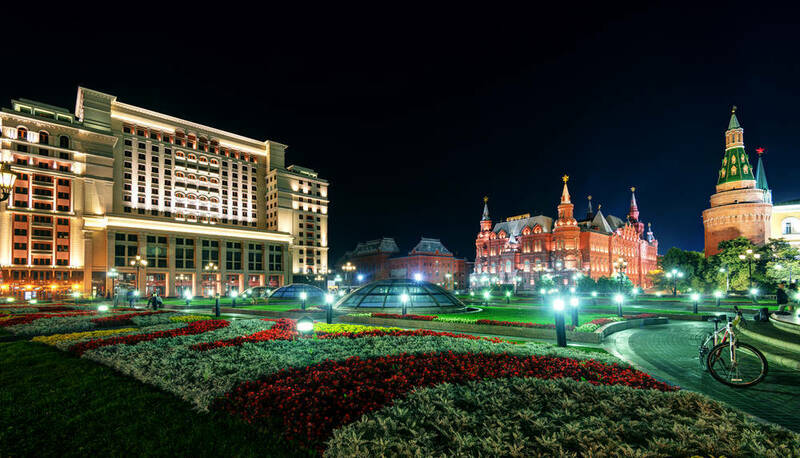 The history of the garden is closely related to Moscow’s past, as its monuments remind visitors of Russian military batles, tsars, generals and heroes. 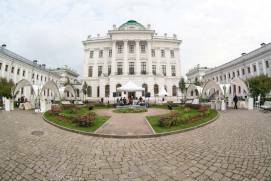 Near the garden are the beautiful buildings of the Central Manege and Pashkhov House, and the huge underground Okhotny Ryad Shopping Mall is right under the garden. 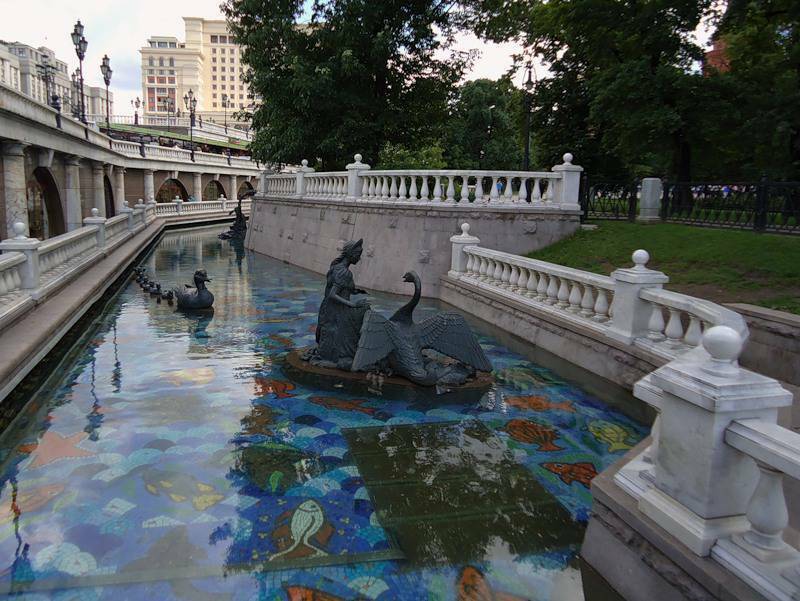 The Alexander Garden is a great place to relax outside, away from the city’s blare and bustle. 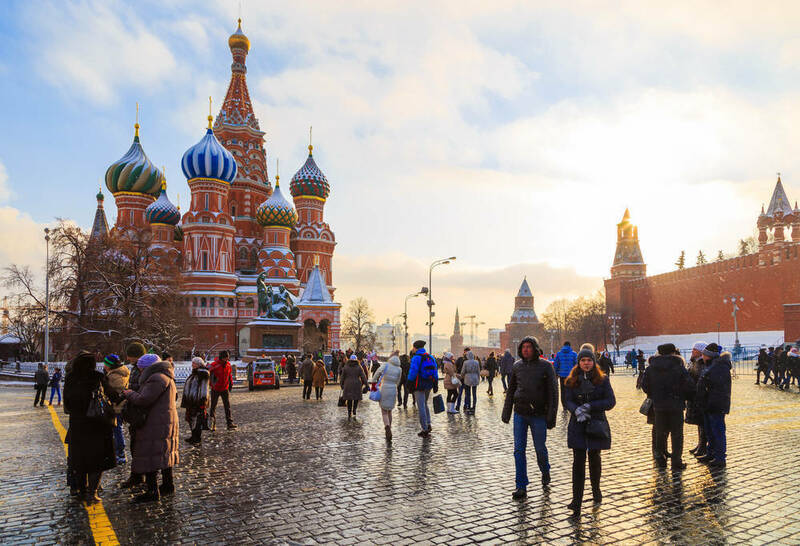 This area to the east of Red Square boasts one of the oldest streets in Moscow, a multitude of architectural monuments and museums, as well as an active government quarter. 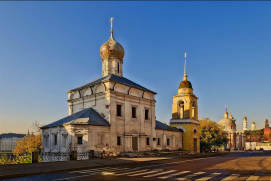 It is here that vicitors usually start their visit to the historical part of Moscow, bordered by Okhotny Ryad Street, Teatralny Lane, Novaya (‘New’) Square, Staraya (‘Old’) Square, Kitaygorodsky Lane and Moskvoretsky Embankment. 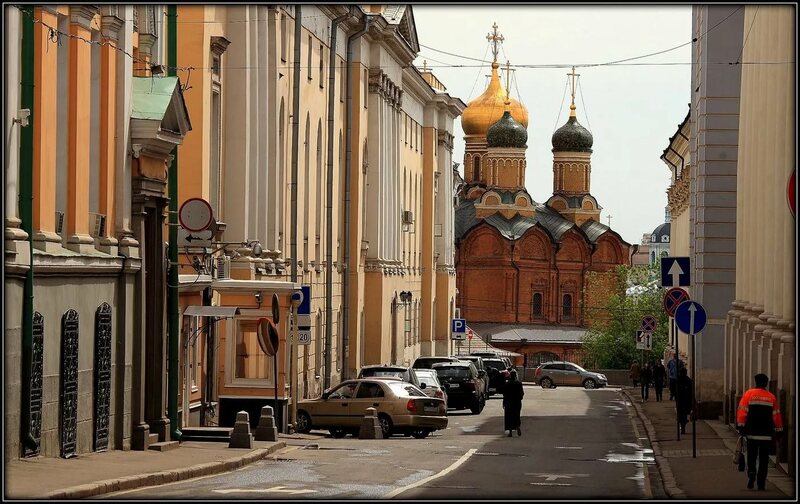 Kitai-gorod’s stone wall, whose remnants are still visible today, once passed along these streets. 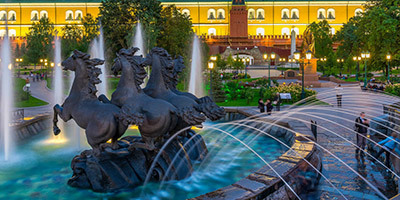 The Zaryadye Landscape Urban Park was opened here in Autumn 2017.